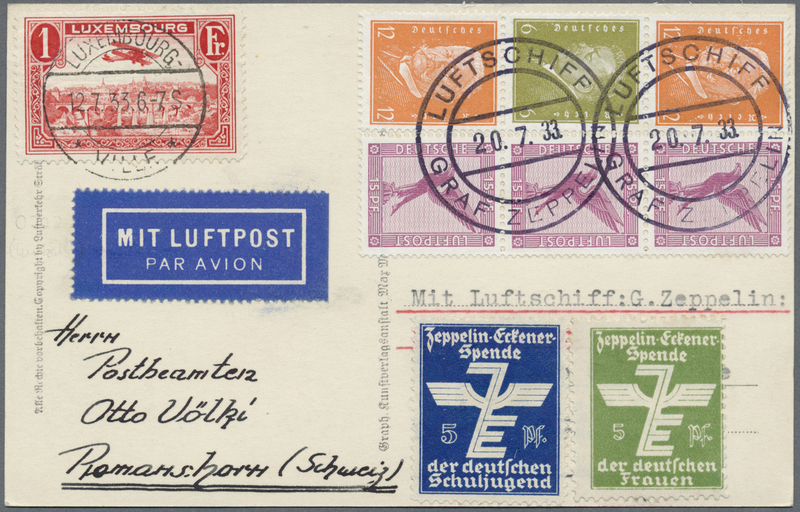 13718 Ganzsache (Complete) SI 247 1936. 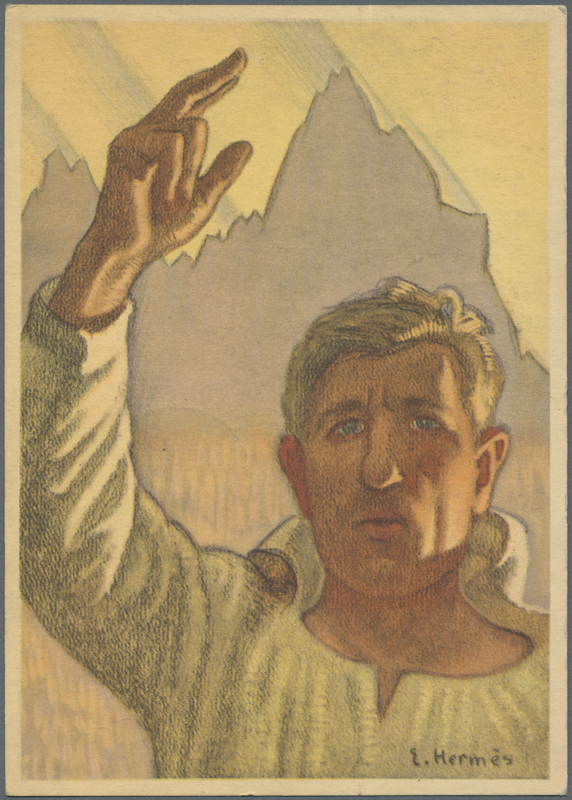 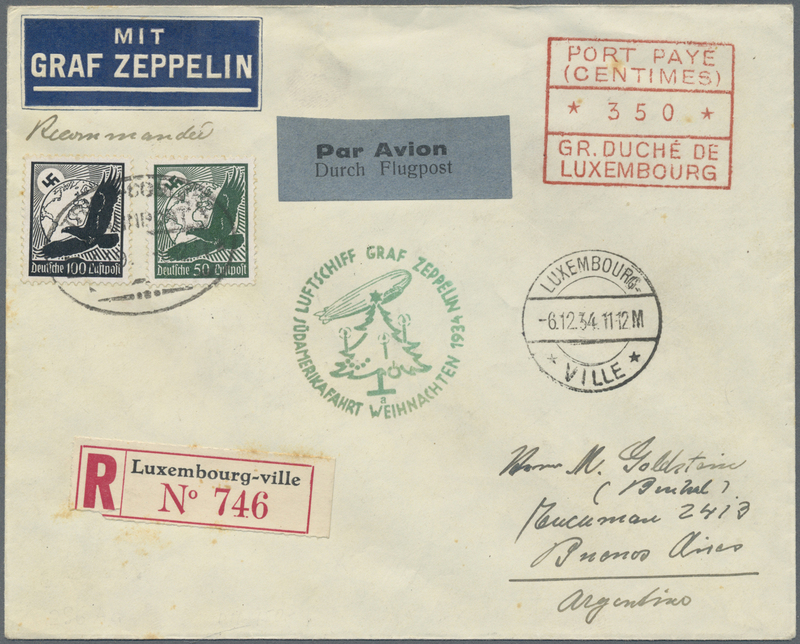 Swiss Bundesfeier upfranked postal stationery entire card flown aboard the Hindenburg Zeppelin airship's 1936 Olympic flight. 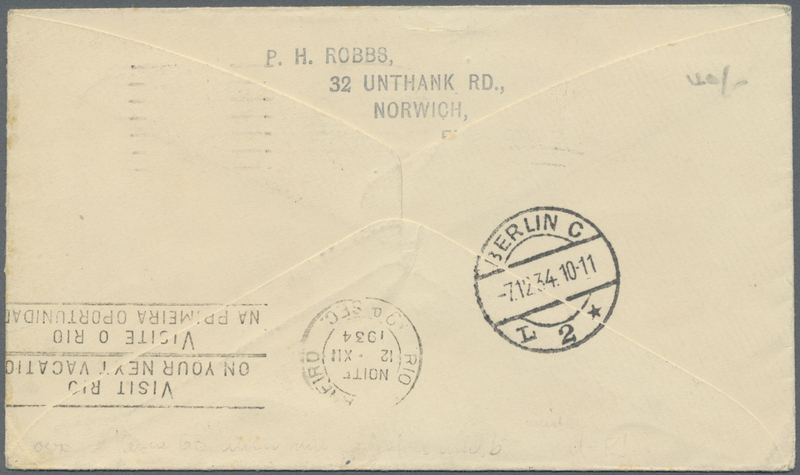 Slightly worn, very good condition. 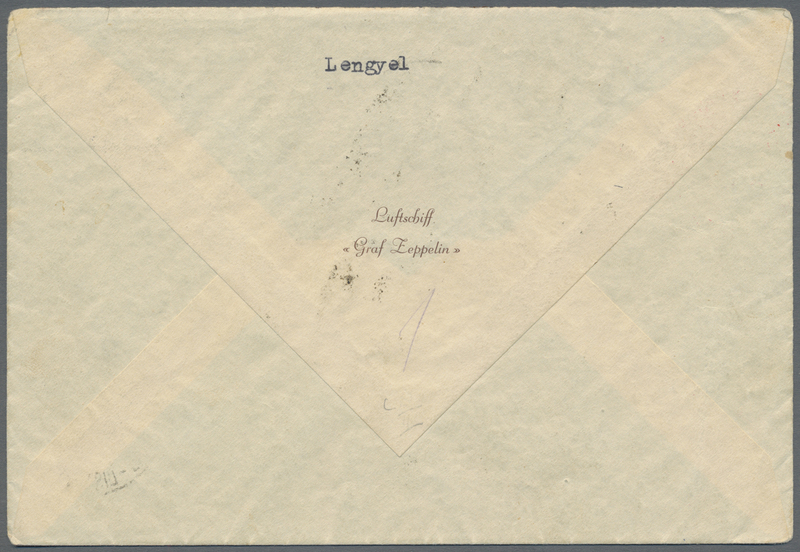 Lovely card. 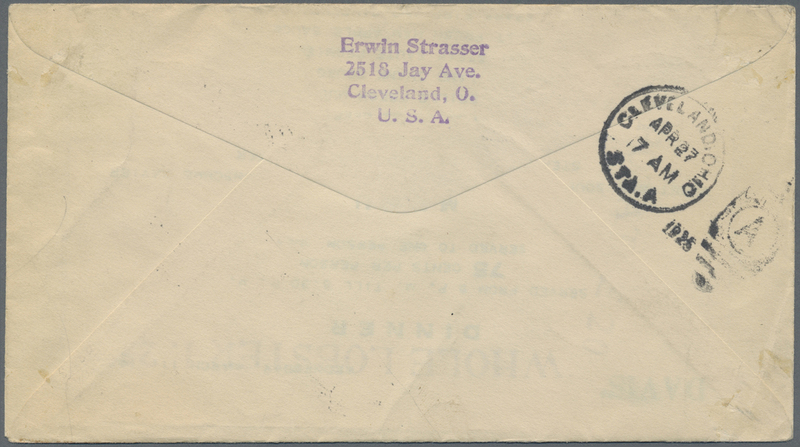 13737 Brief (cover) Si406 1936. 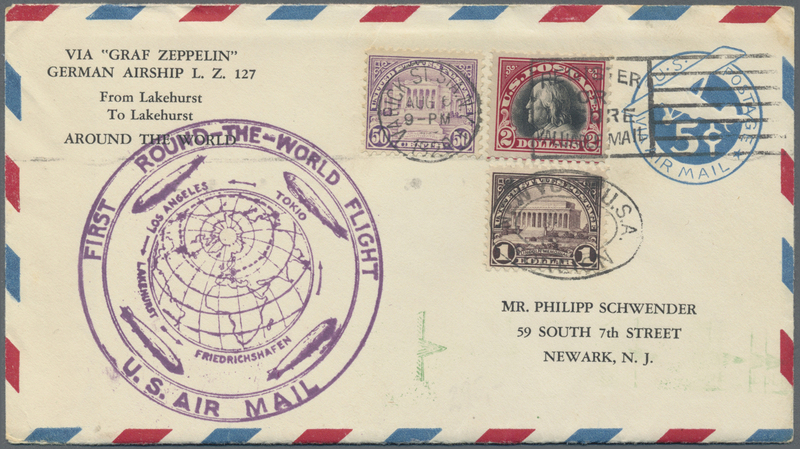 Double-franked Zeppelin card flown on the Hindenburg's 1st 1936 North American flight; sent from the Vatican, carrying additional Italian stamps, canceled in the Vatican and at the Rome Train Station (Ferrovia) with New York GPO arrival cancel and the Deutsche Luftpost 'c' Zeppelin cachet. 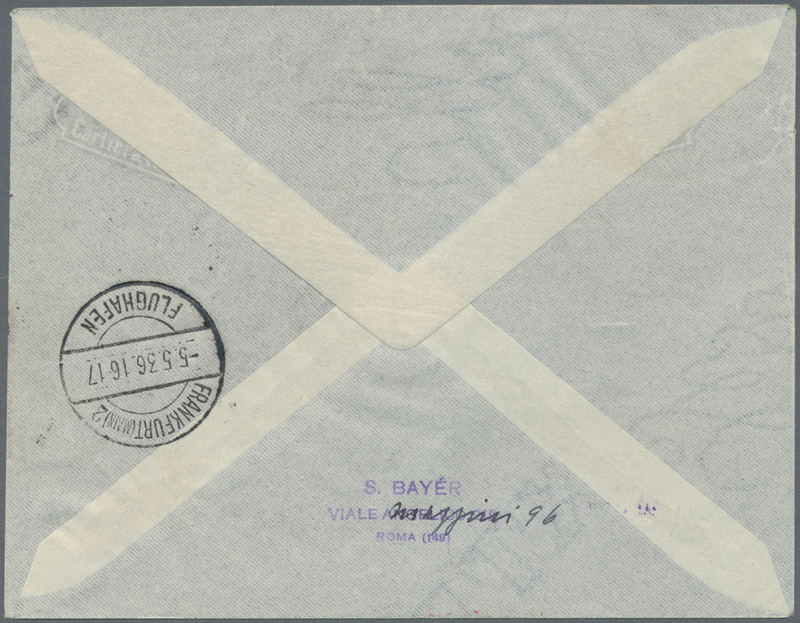 Top condition. 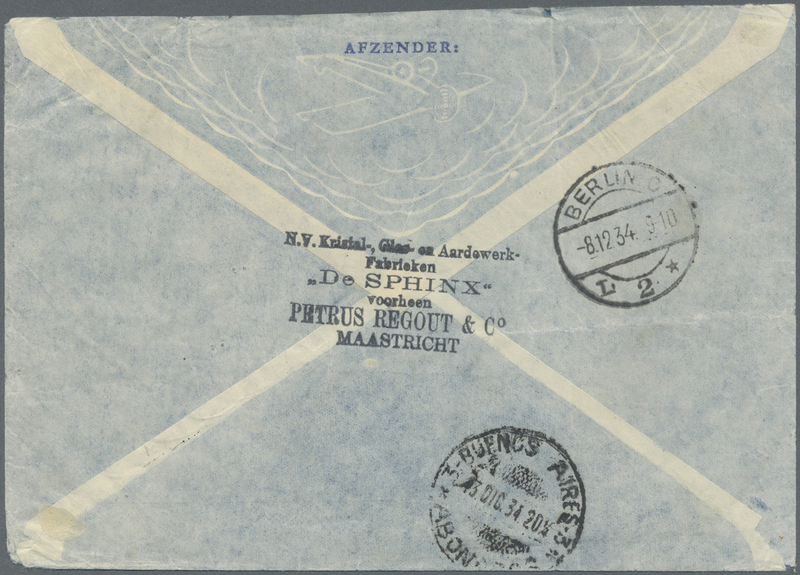 13738 Brief (cover) SI 408 D 1936. 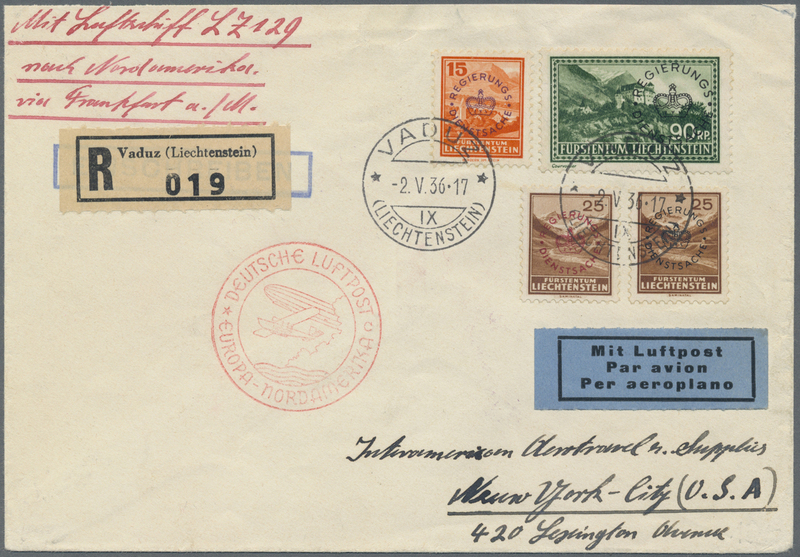 Liechtenstein registered cover flown on the Hindenburg Zeppelin LZ129 airship's 1936 1st Nordamerikafahrt / North American flight. 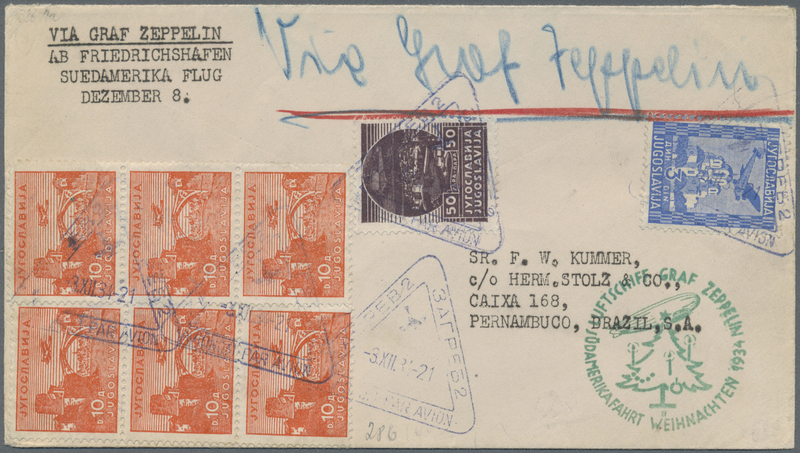 Slightly worn, excellent condition. 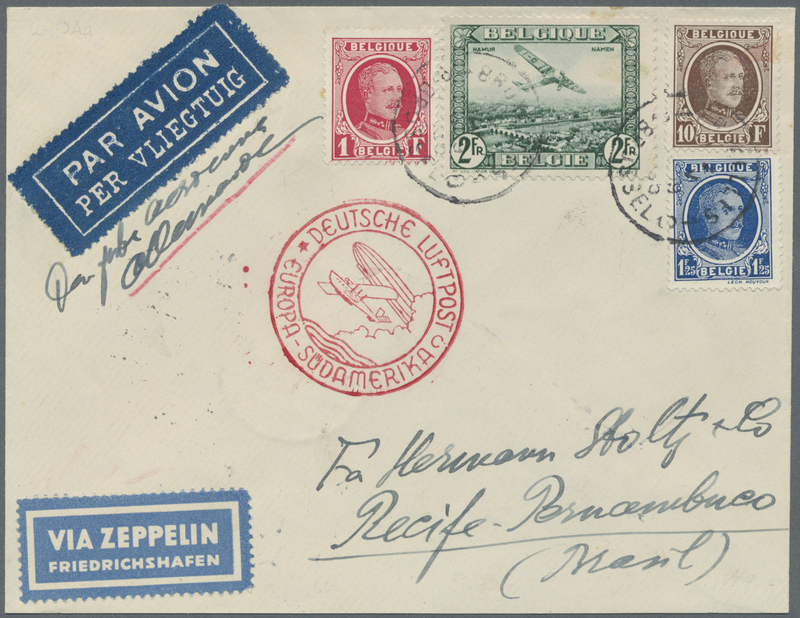 '01 CV EUR450; rare with Dienstpost / official mail stamps. 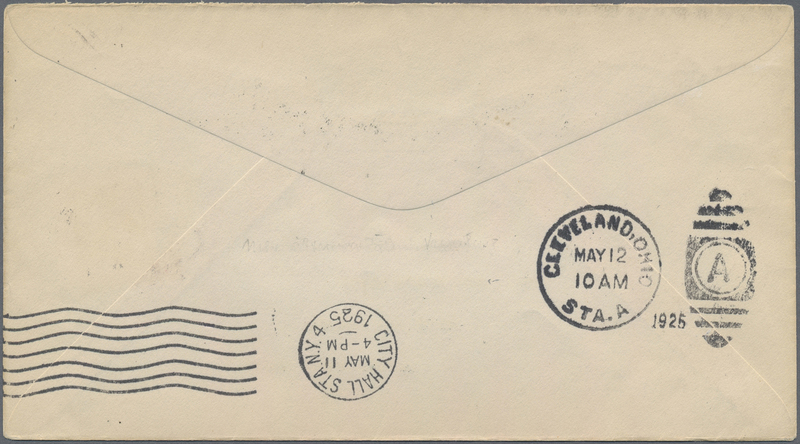 13743 Brief (cover) Si439 1936. 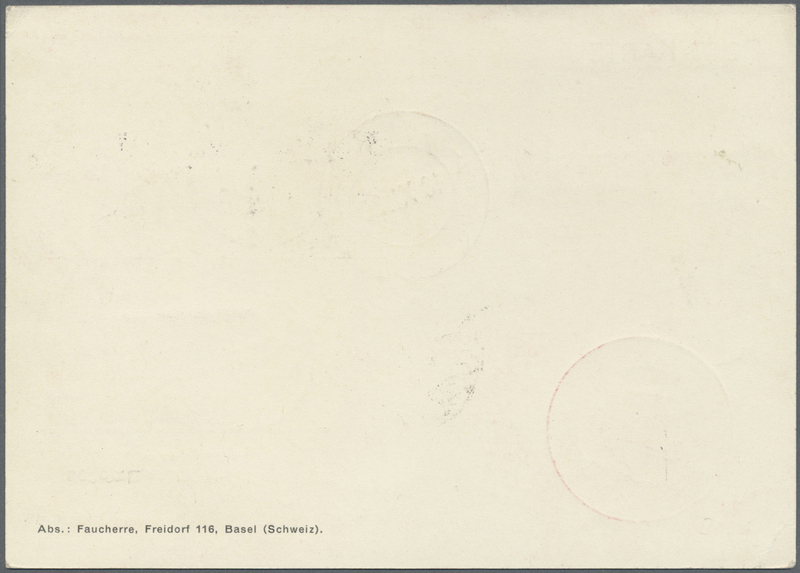 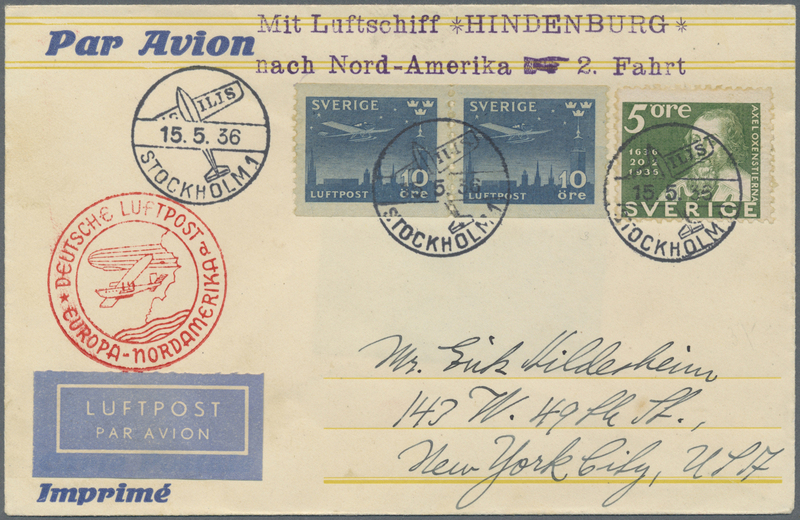 Swedish registered card sent on board the Hindenburg Zeppelin airship's 1936 9. 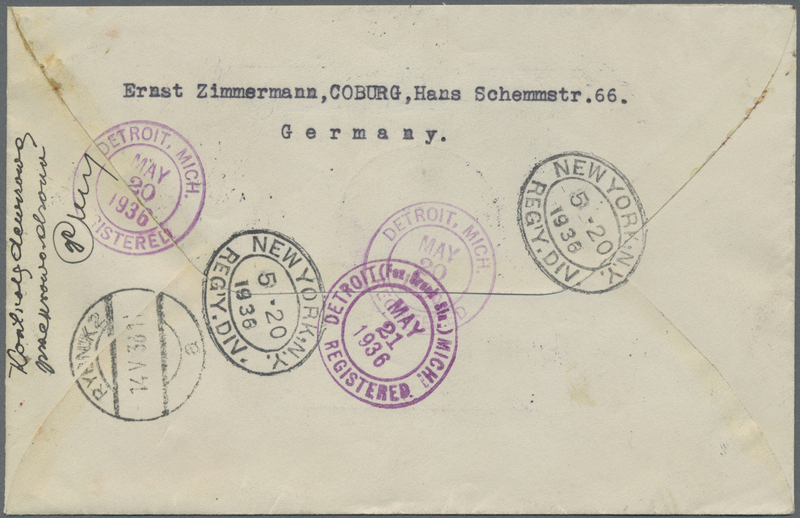 Nordamerikafahrt (NAF) / 9th North America flight. 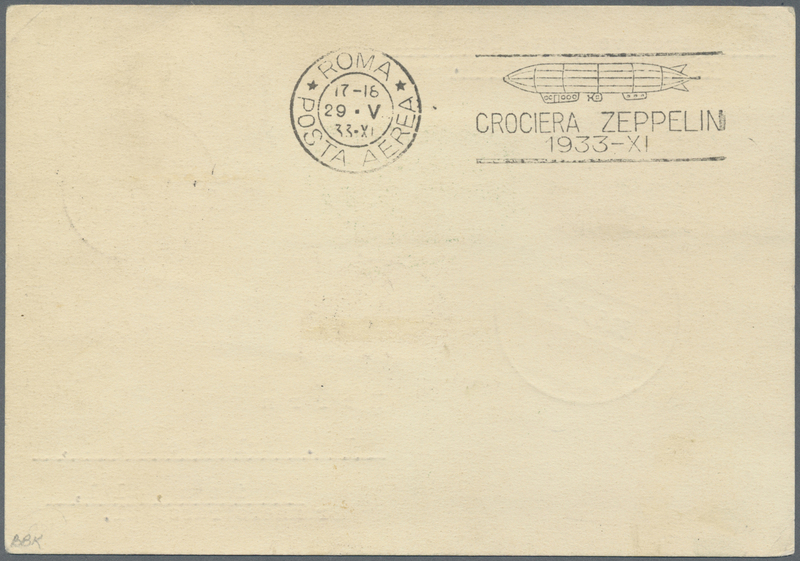 Slightly worn, excellent condition. 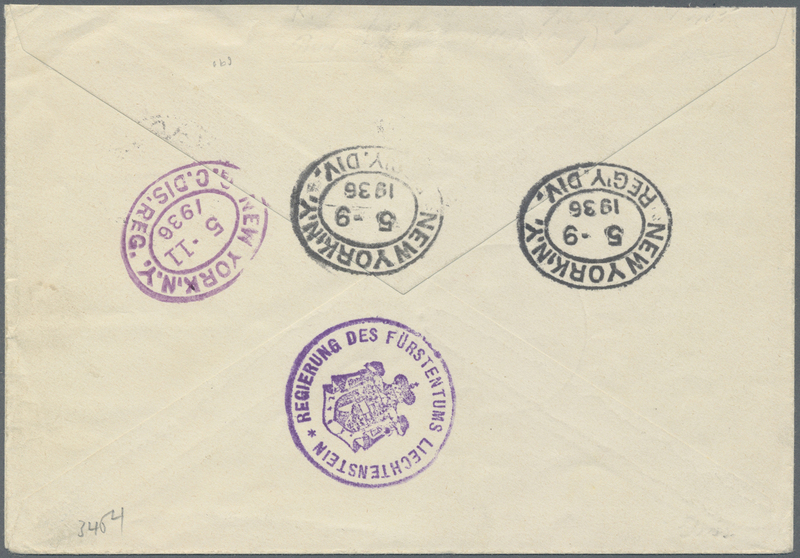 Nice Tuberculosis seal reverse. 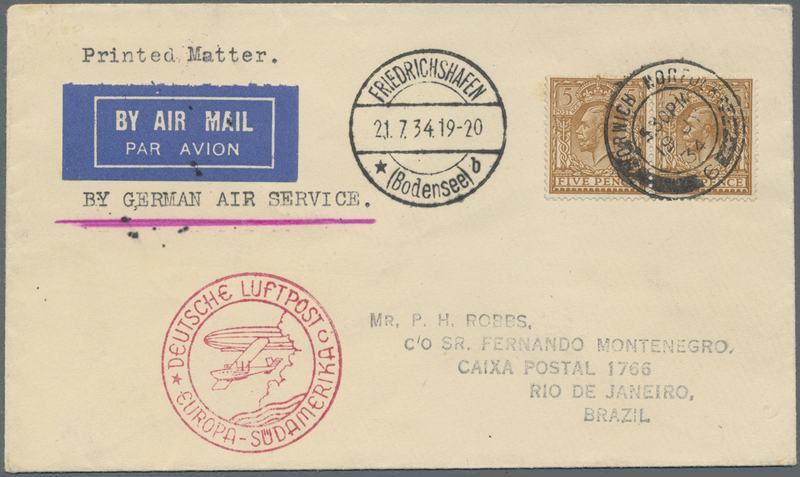 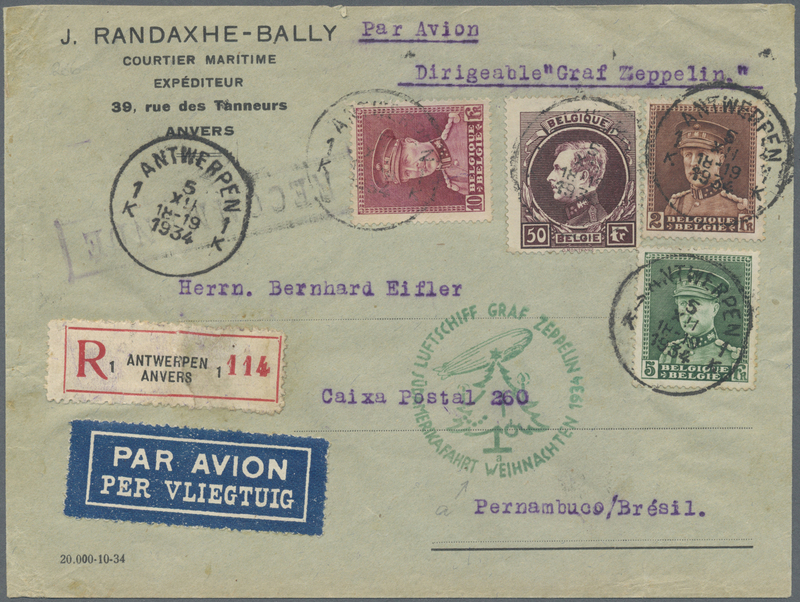 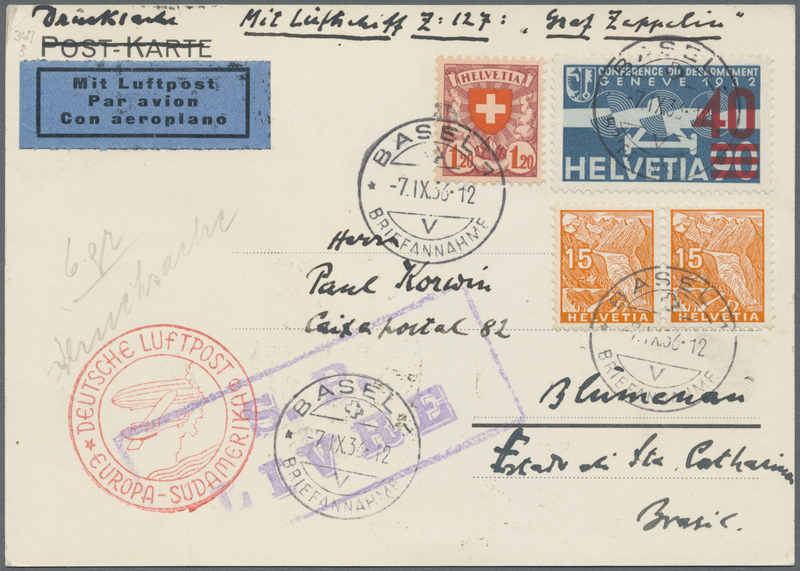 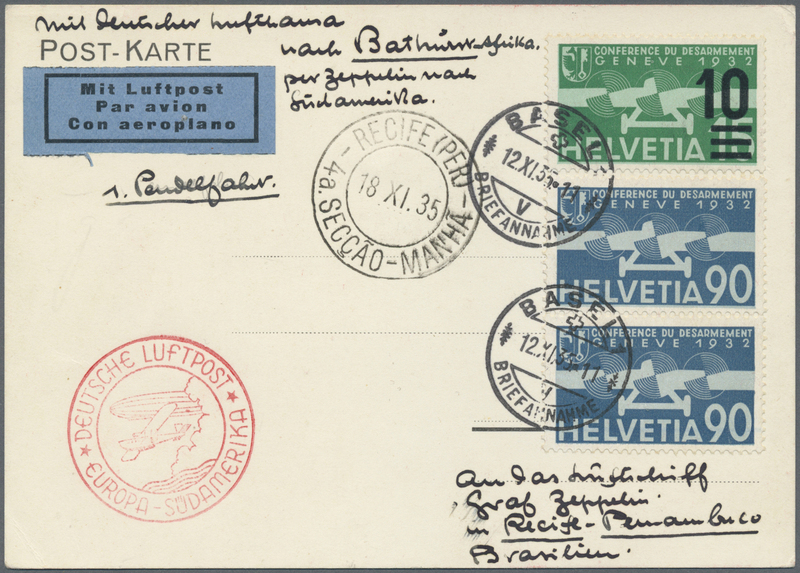 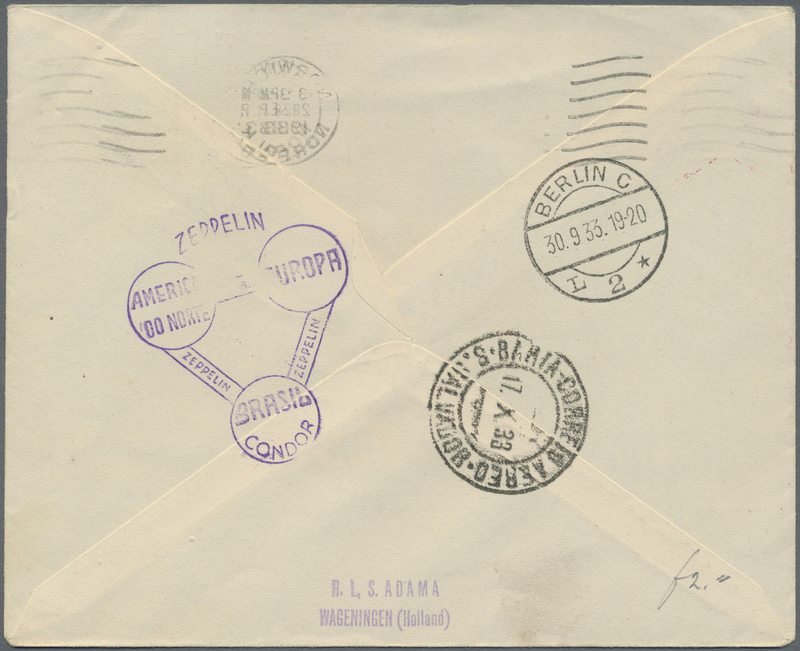 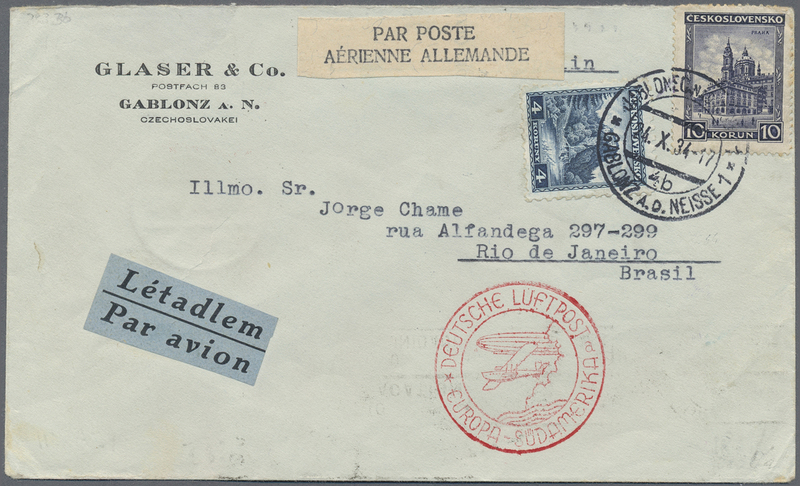 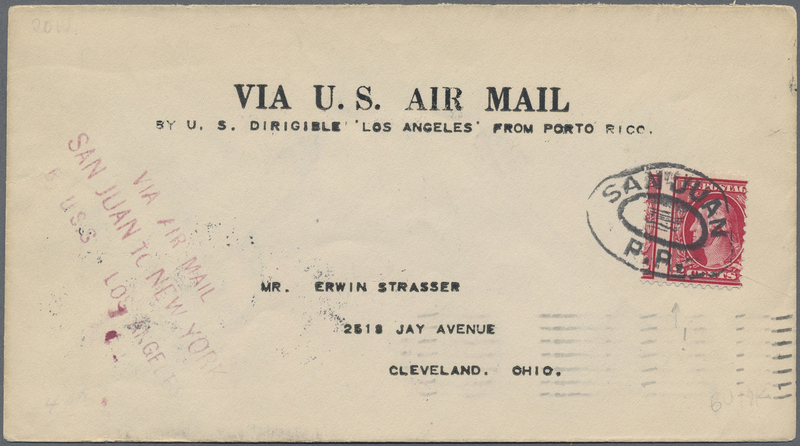 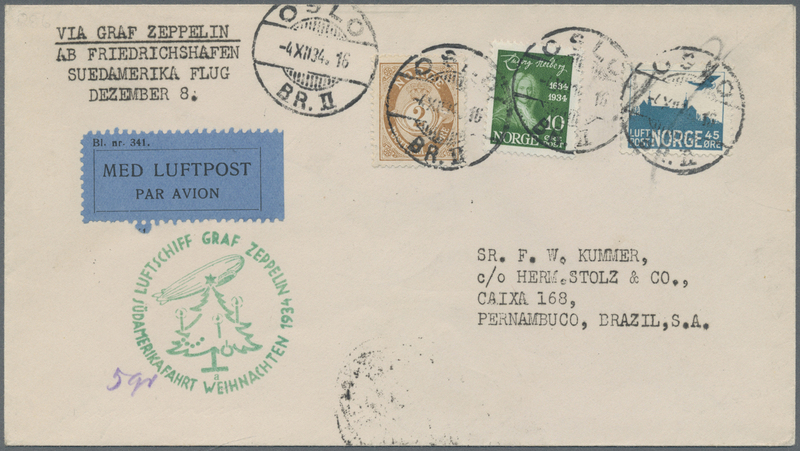 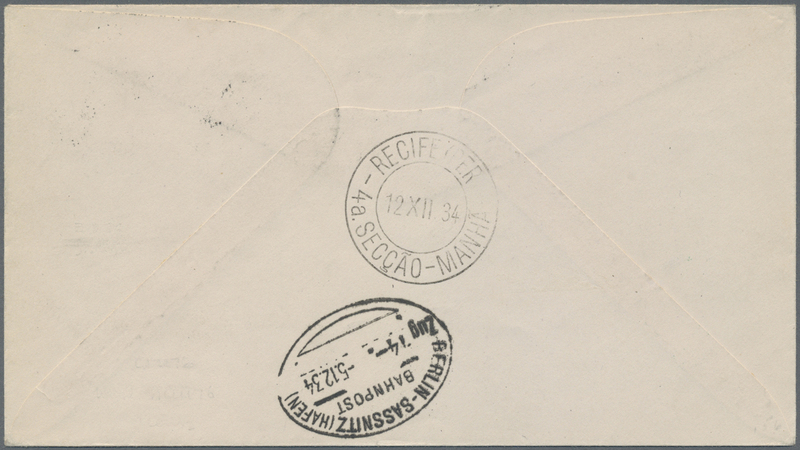 13745 Flugpostbrief (Flight cover) Sieger 463 1939, Airmail card from PRAGUE, connection mail to Zeppelin Germany tour to Essen with LZ130, mixed frank CSR with Bohemia&Moravia"PRAHA 16.VIII.39", with Germany 50 Pf. 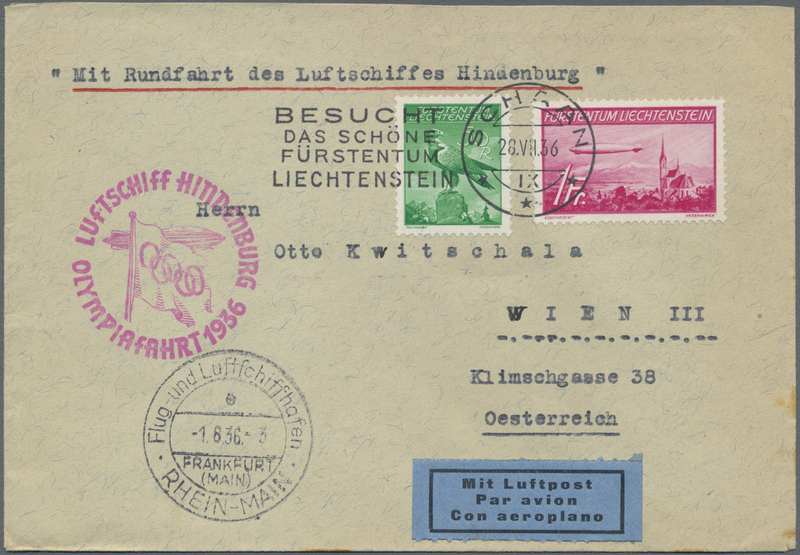 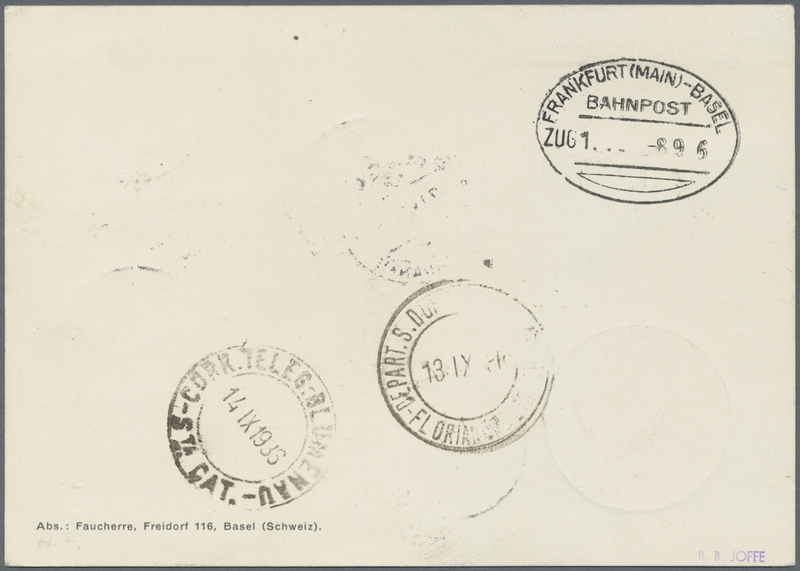 from "Flug-Luftschschiffhafen Rhein-Main 20.8.39" to Linz/Donau with Aug. 23 arrival. 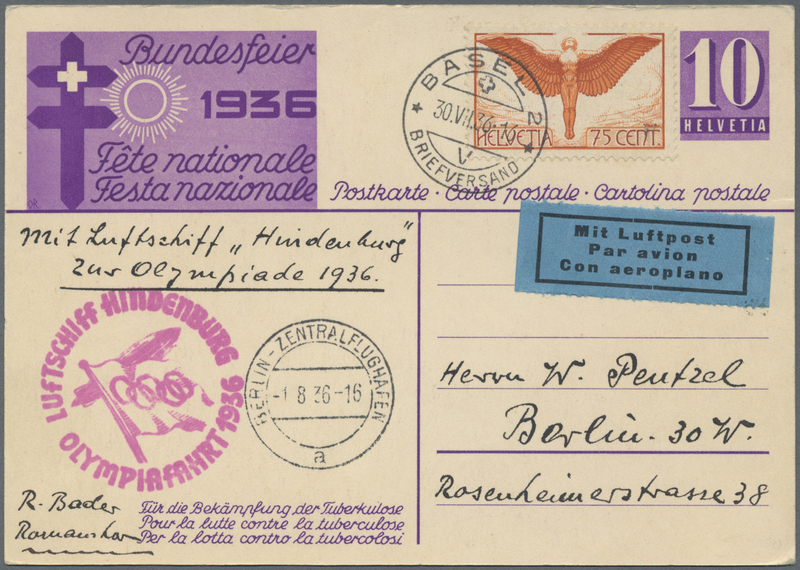 Large red pictorial cachet of "Deutschlandfahrten 1939". 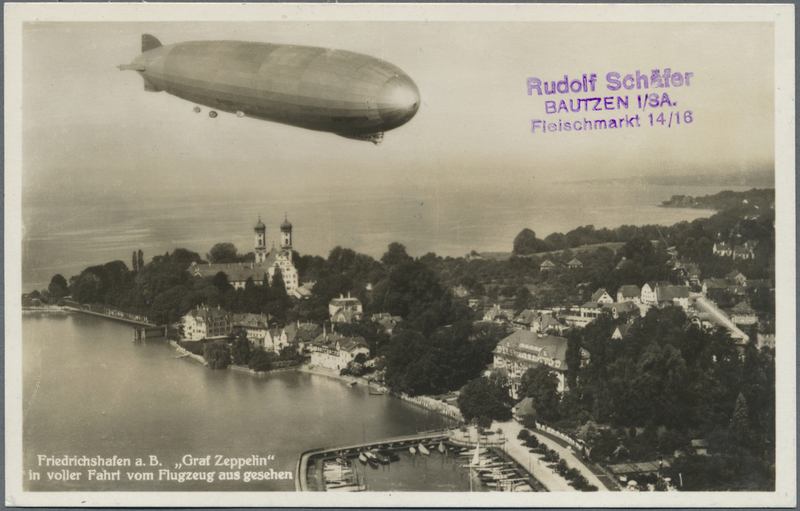 - This was the last Zeppelin flight which actually took place, before WW II stopped any more Zep flights. 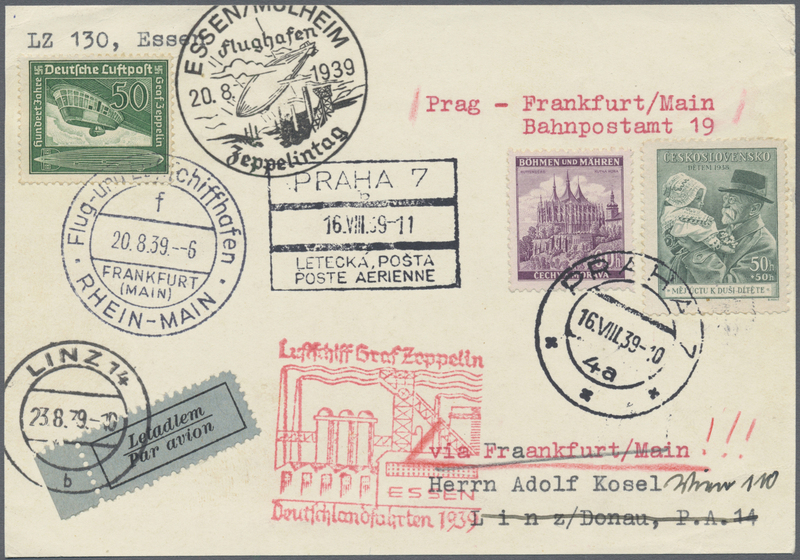 ÷ 1939, Luftpostkarte ab PRAG, Zuleitung zur Deutschlandfahrt nach Essen mit LZ130, MiFr CSR-Böhmen&Mähren "PRAHA 16.VIII.39" mit DR 50 Pf. 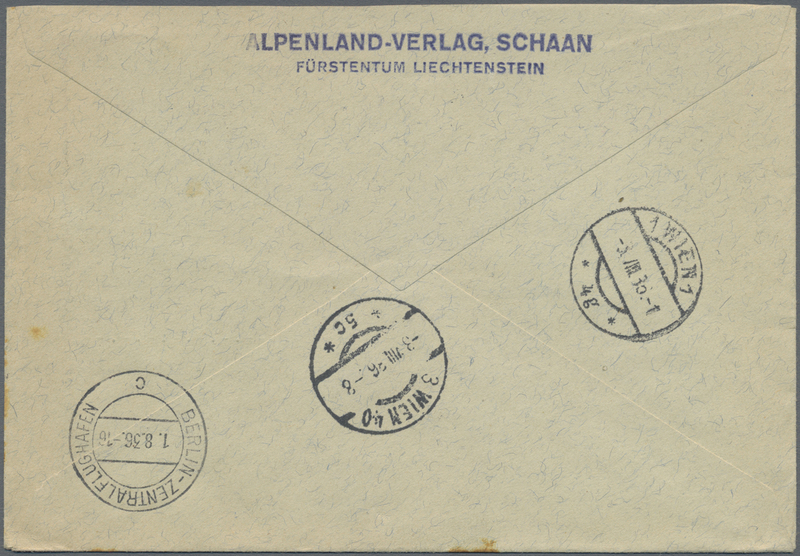 ab "Flug-Luftschschiffhafen Rhein-Main 20.8.39" nach Linz/Donau an 23.8.1939. 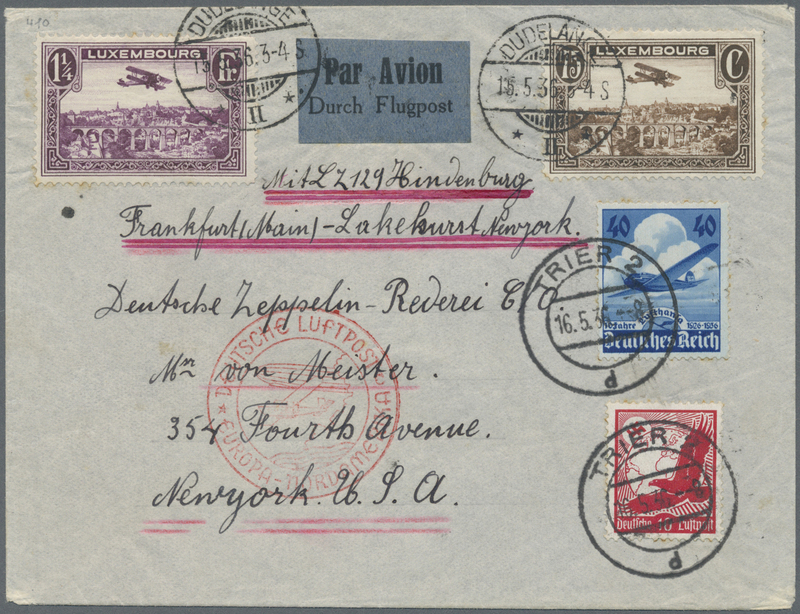 Großes rotes cachet der "Deutschlandfahrten 1939". 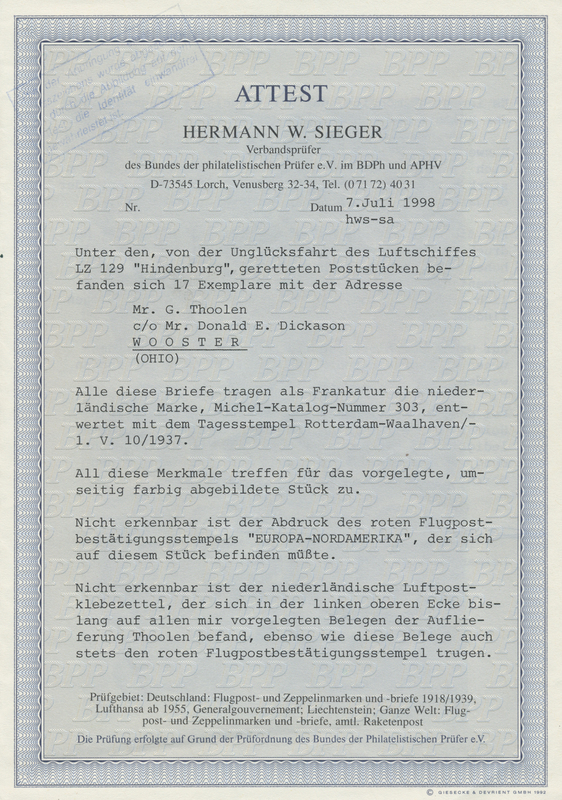 Letzter durchgeführter Zeppelinflug, bevor der Beginn des 2. 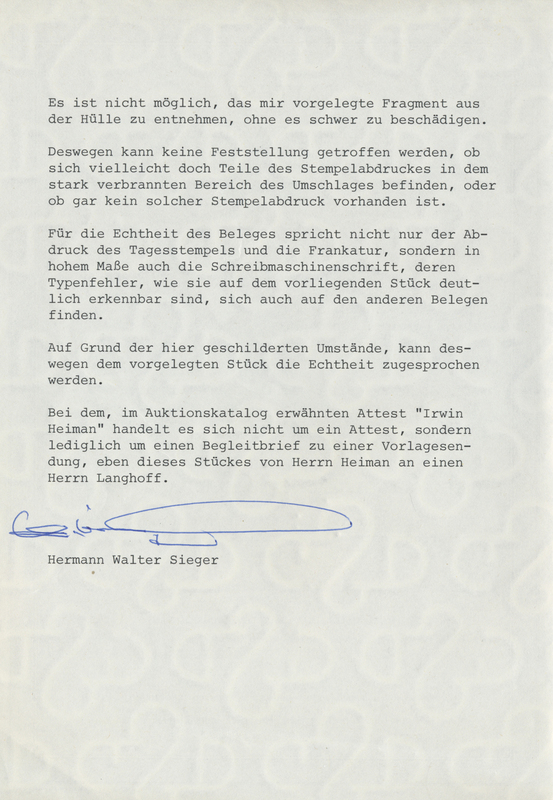 Weltkriegs alle weitere Projekte stoppte. 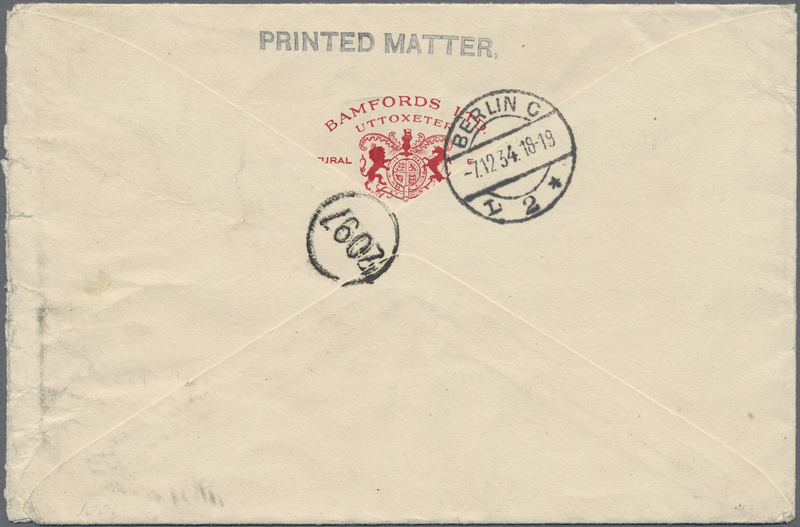 13747 Brief (cover) 1932. 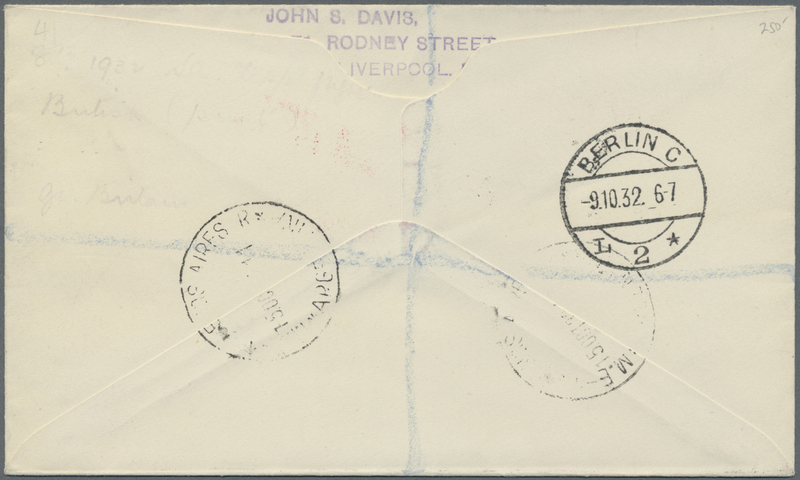 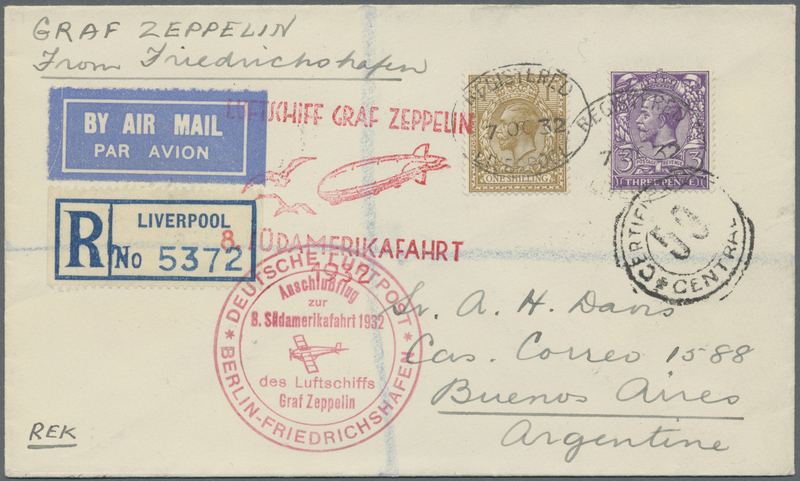 British Liverpool registered cover flown on the Graf Zeppelin's 4. 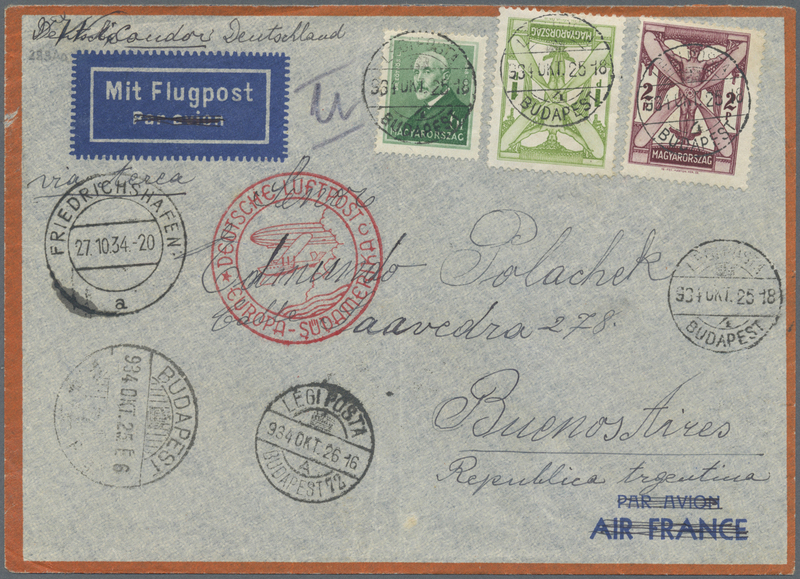 Südamerikafahrt / 4th South America flight. 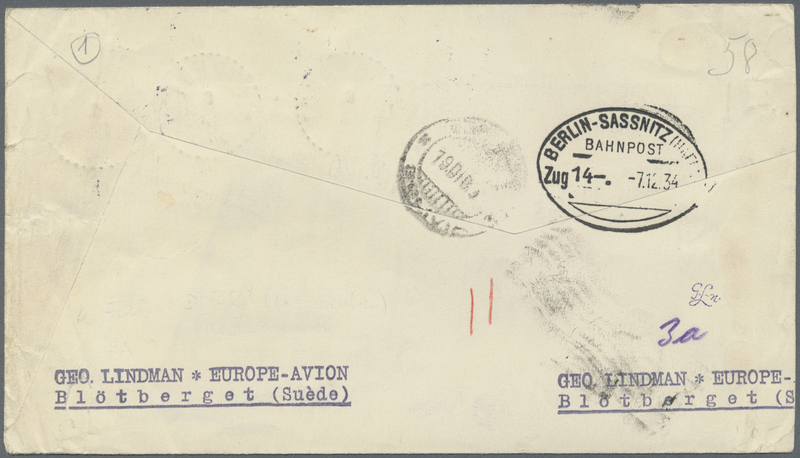 Anschlussflug / Berlin connecting flight. 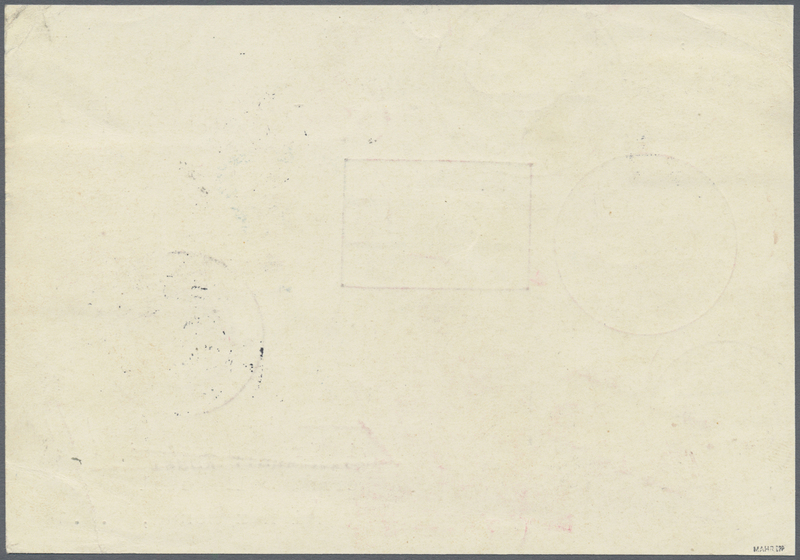 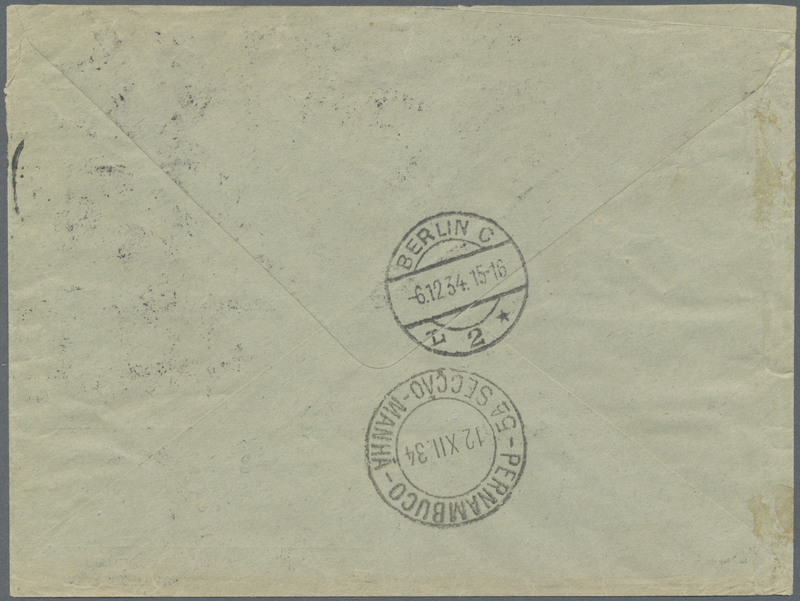 13748 Brief (cover) 1933. 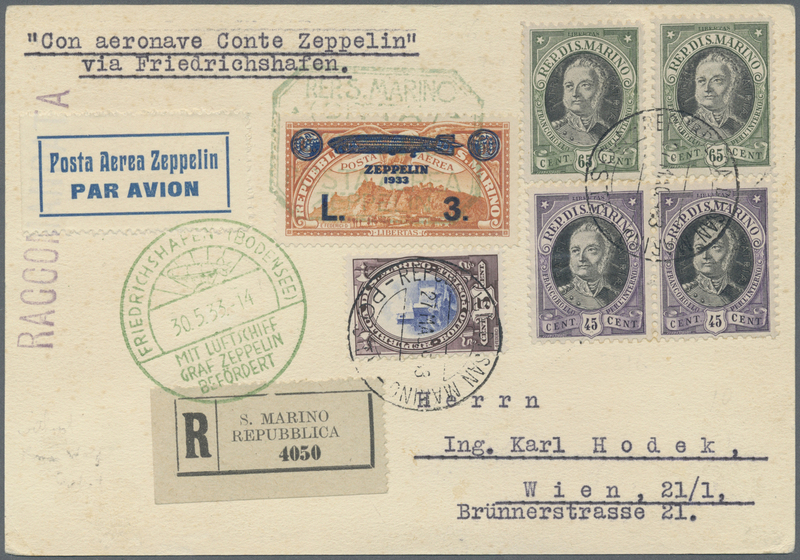 Registered treaty card from San Marino, flown on the 1933 Romfahrt / Rome Italy Flight of the Graf Zeppelin. 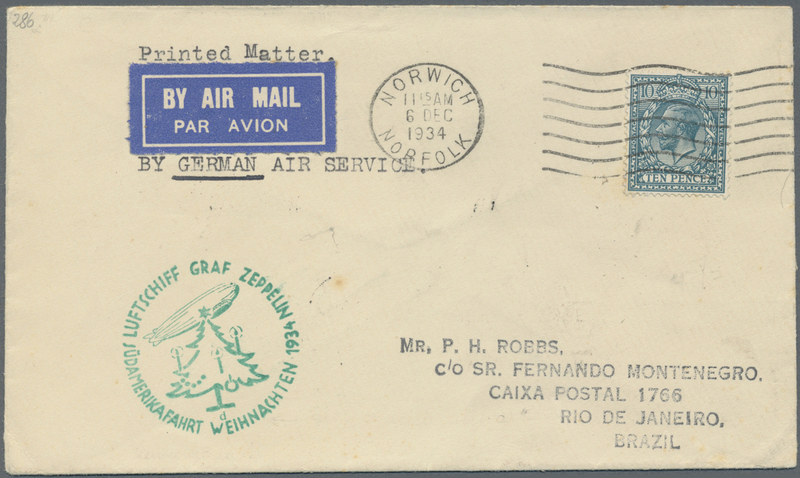 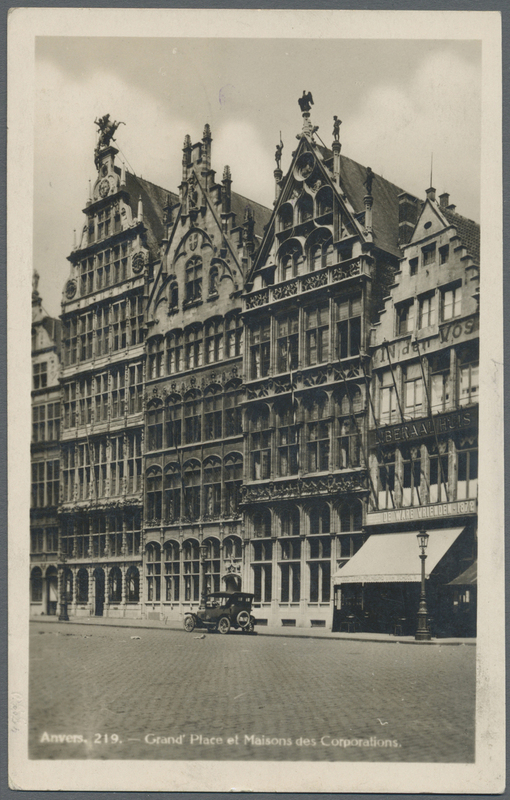 13750 Brief (cover) 1934. 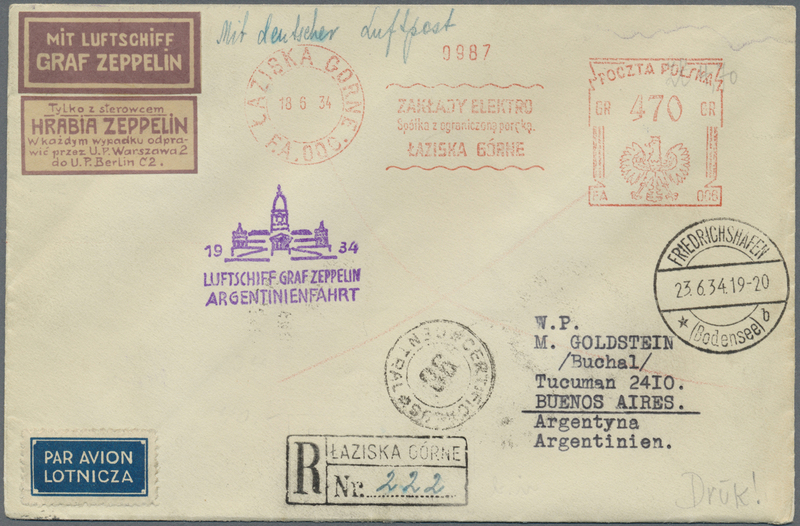 Original cover flown on the Graf Zeppelin LZ127 airship's 1934 Weihnachten Südamerikafahrt (SAF) / South American Christmas Germany flight. 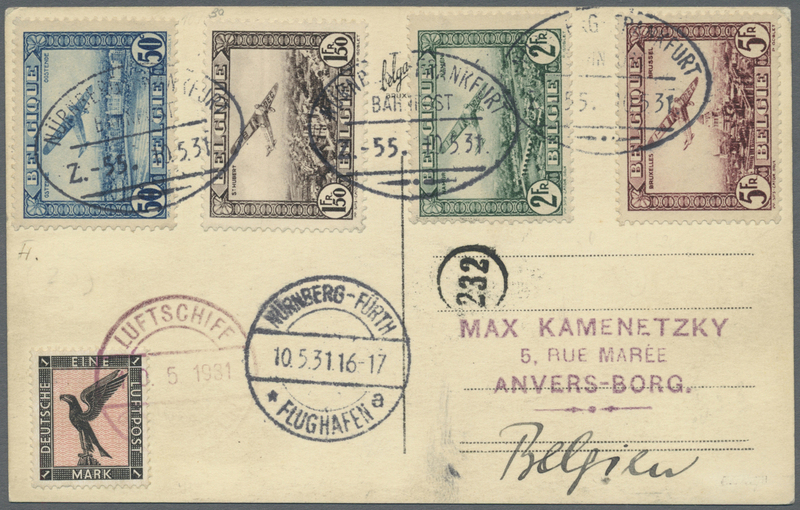 Very rare usage; paid with Luxembourg / Luxemburg meter and German airmail stamps. 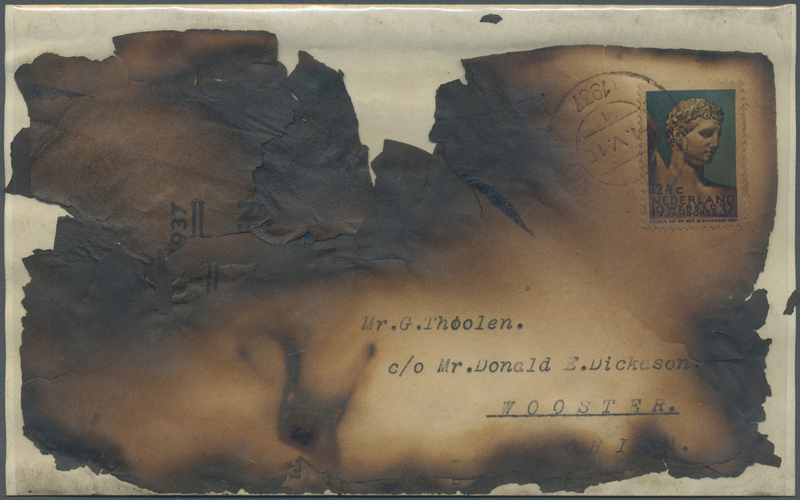 Slightly worn, excellent used condition. 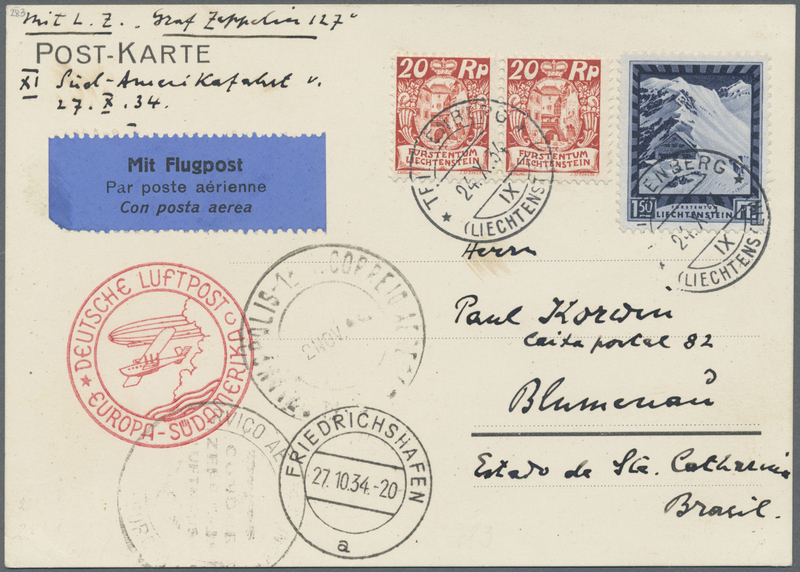 Uncatalogued in Sieger. 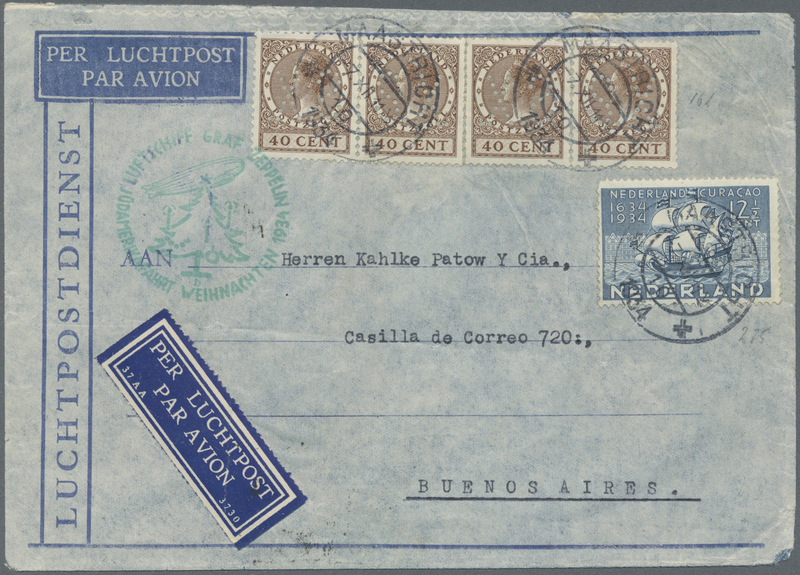 13751 Brief (cover) 1934. 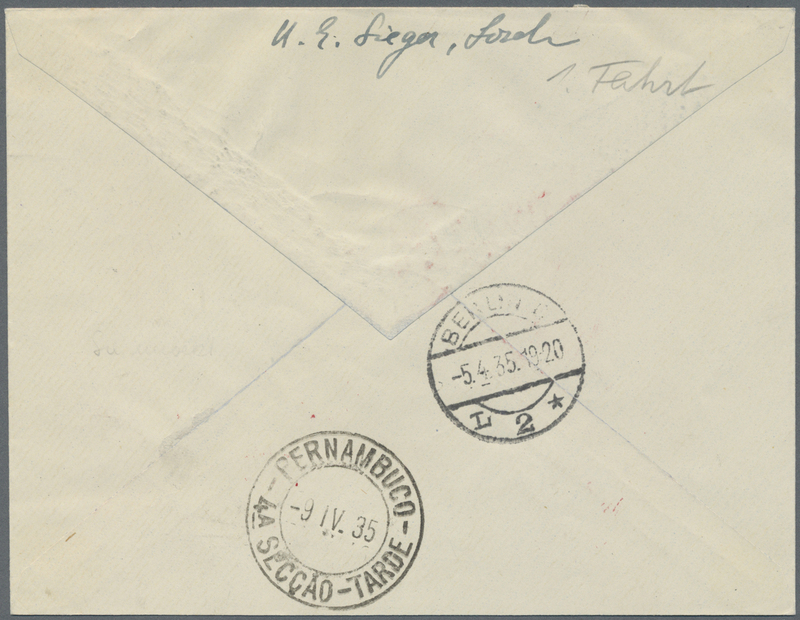 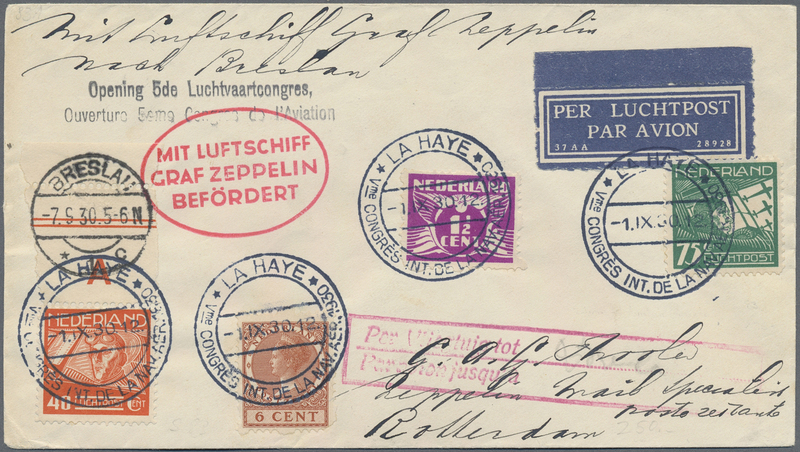 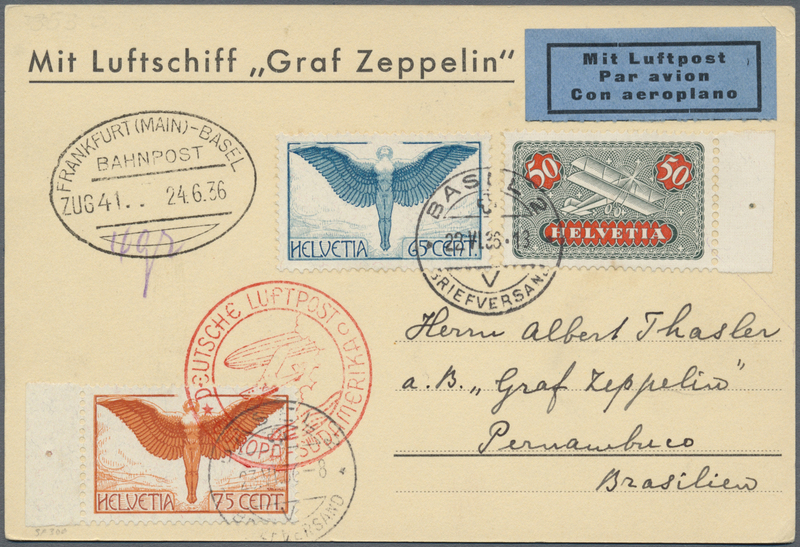 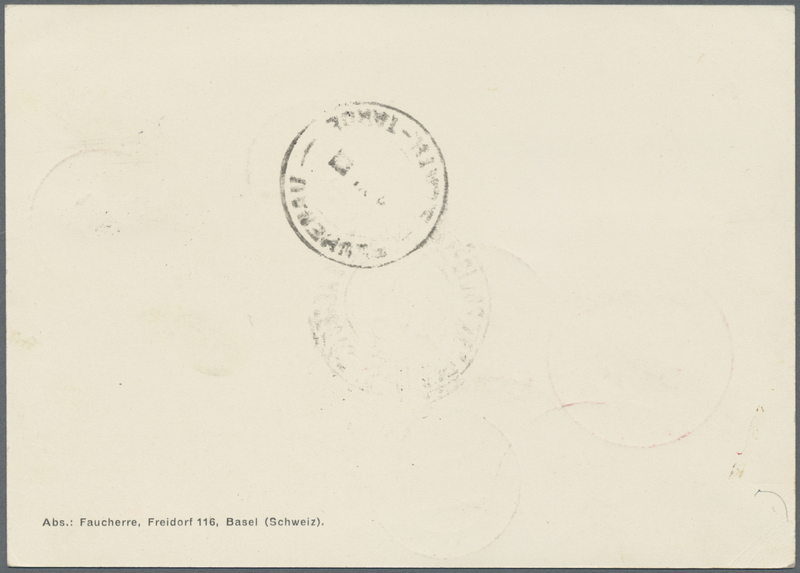 British cover flown on the Graf Zeppelin's 4. 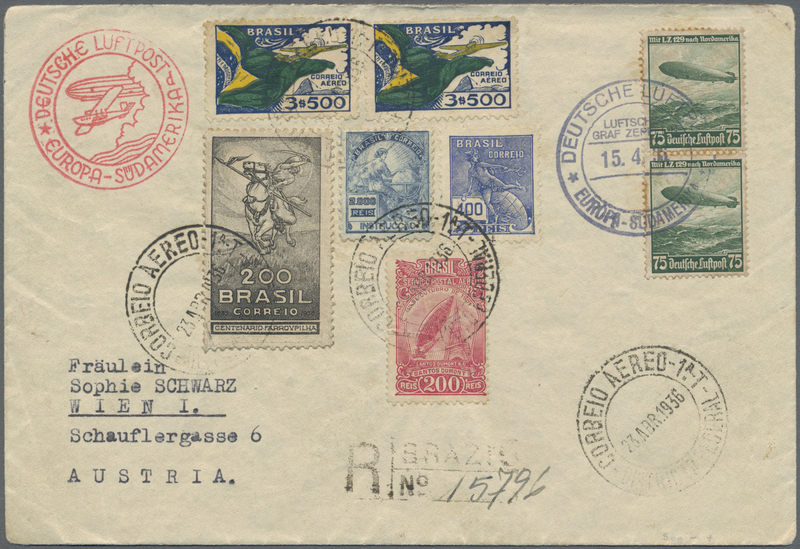 Südamerikafahrt / 4th South America flight. 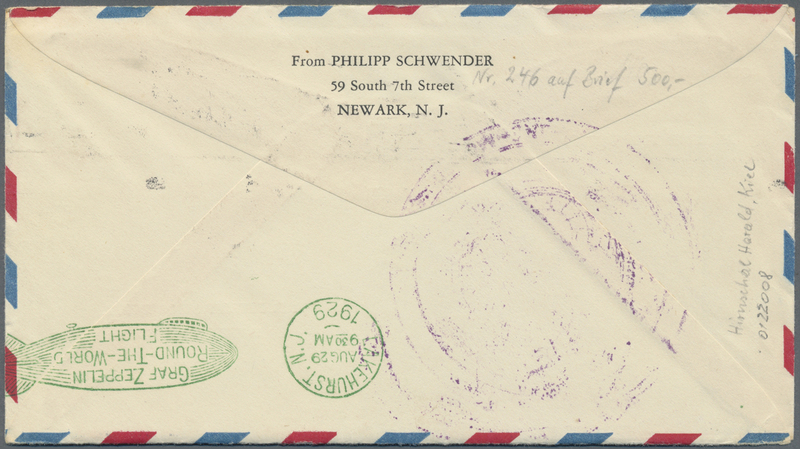 13752 Brief (cover) 1936. 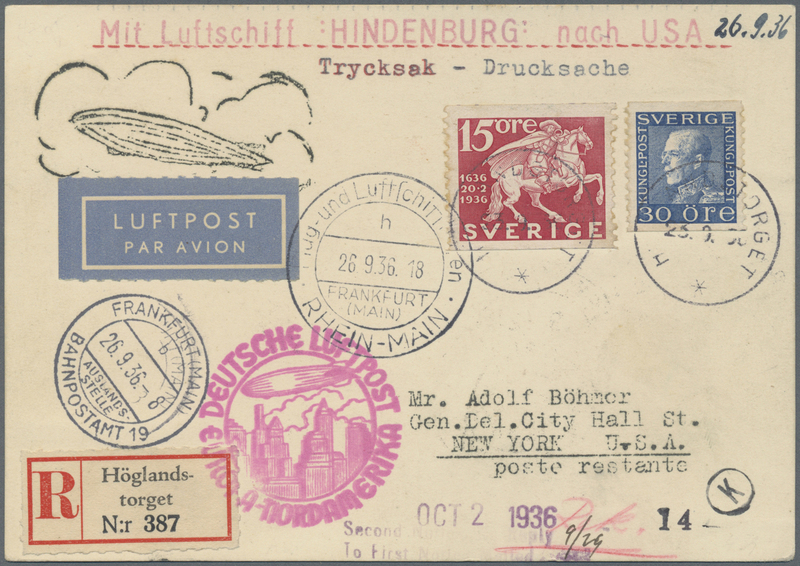 Swedish cover sent on board the Hindenburg Hindenburg Zeppelin airship's 1936 2. 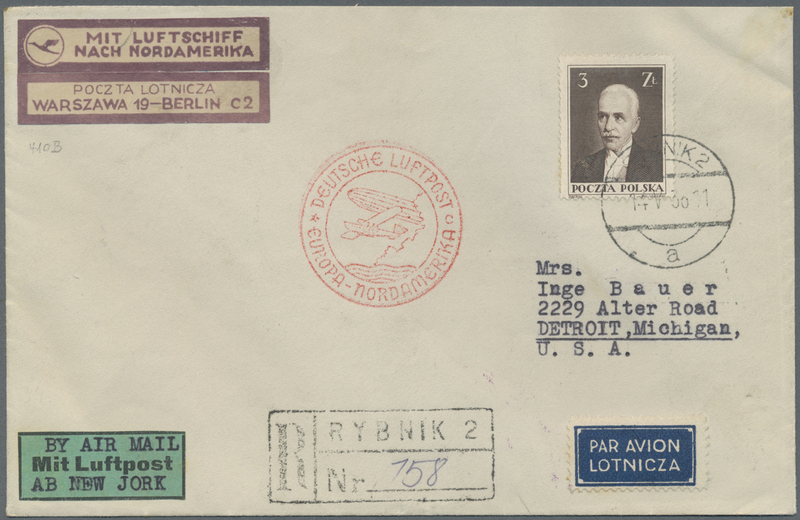 Nordamerikafahrt (NAF) / 2nd North America flight. 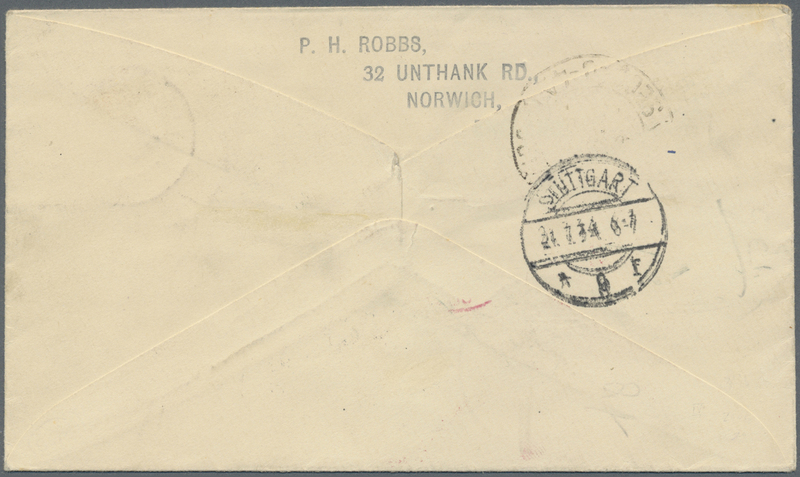 Slightly worn, excellent condition. 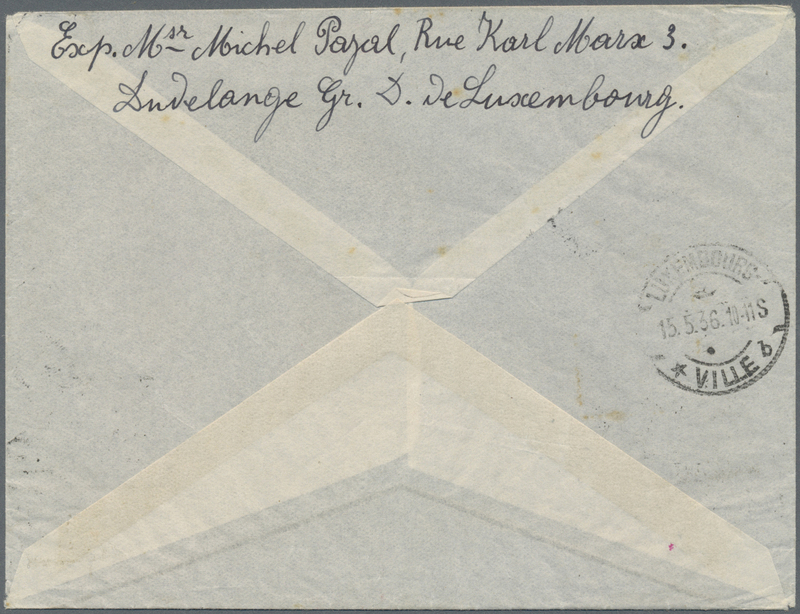 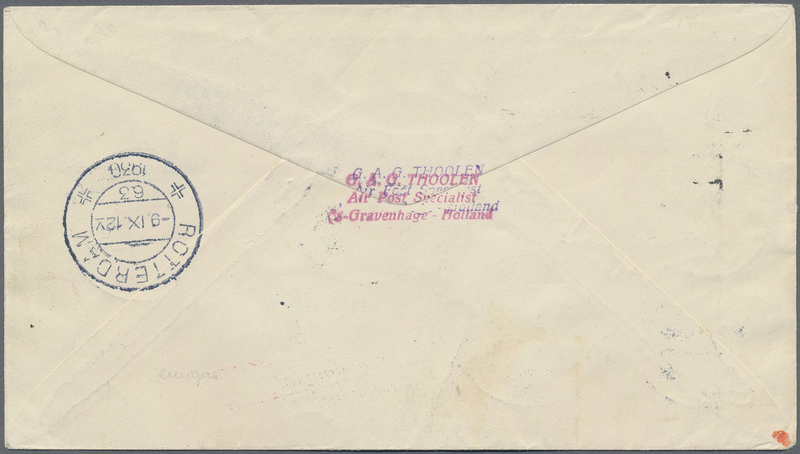 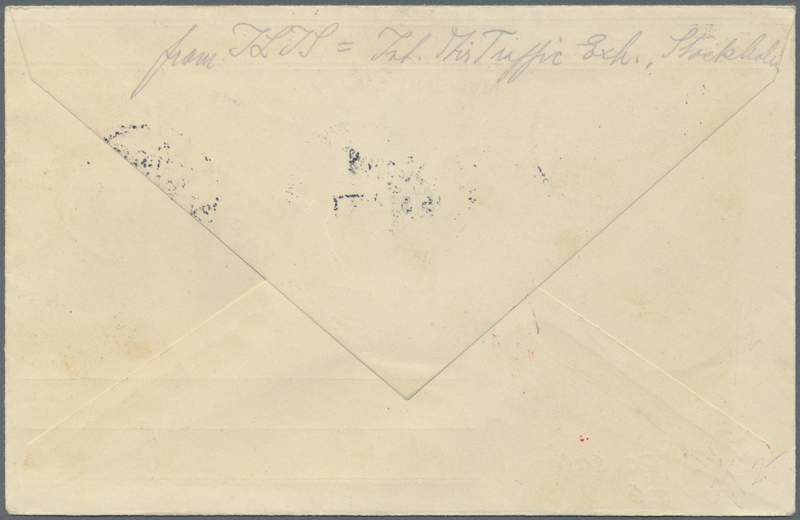 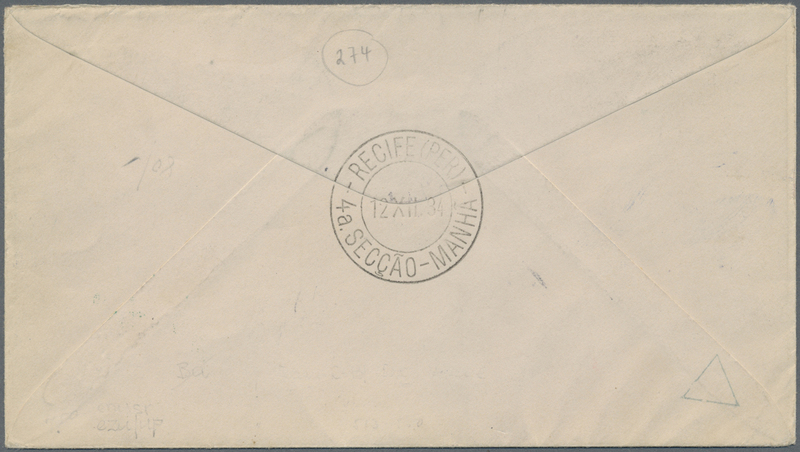 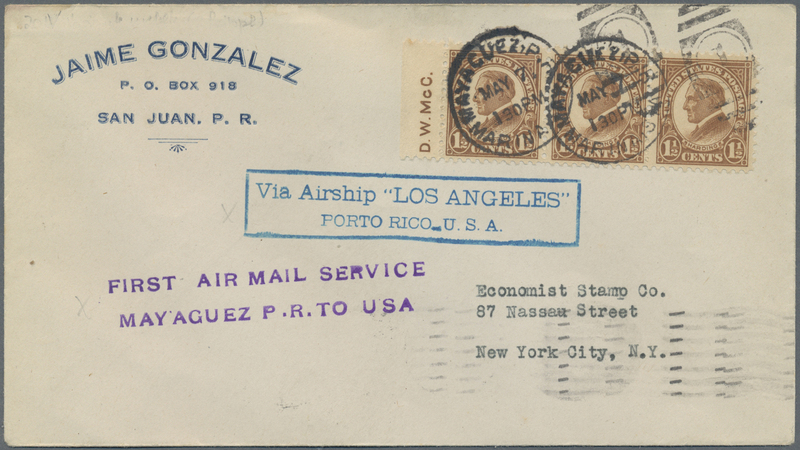 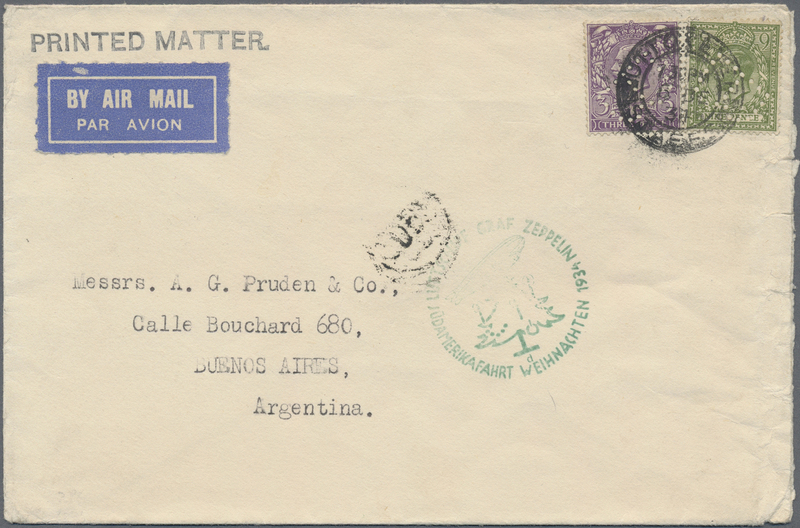 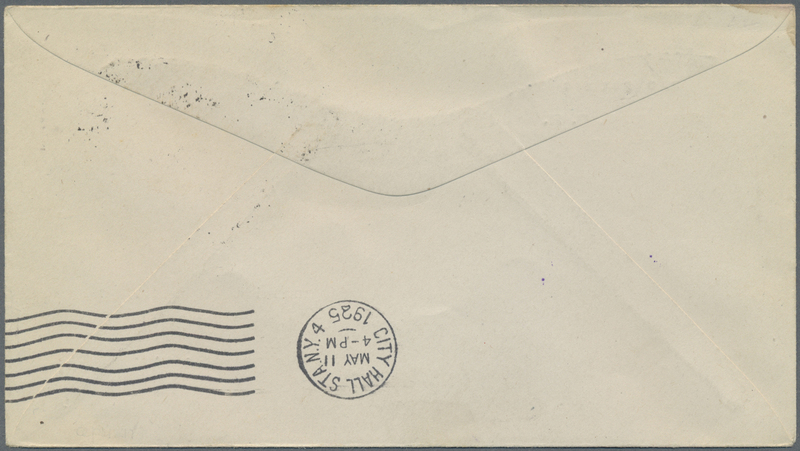 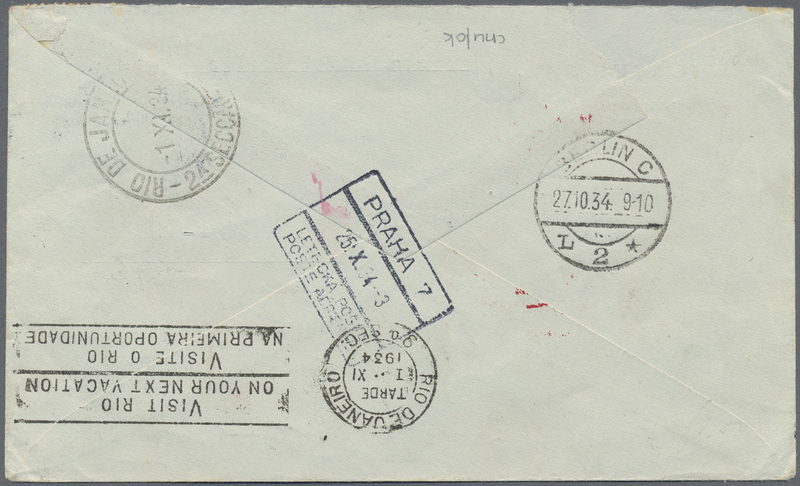 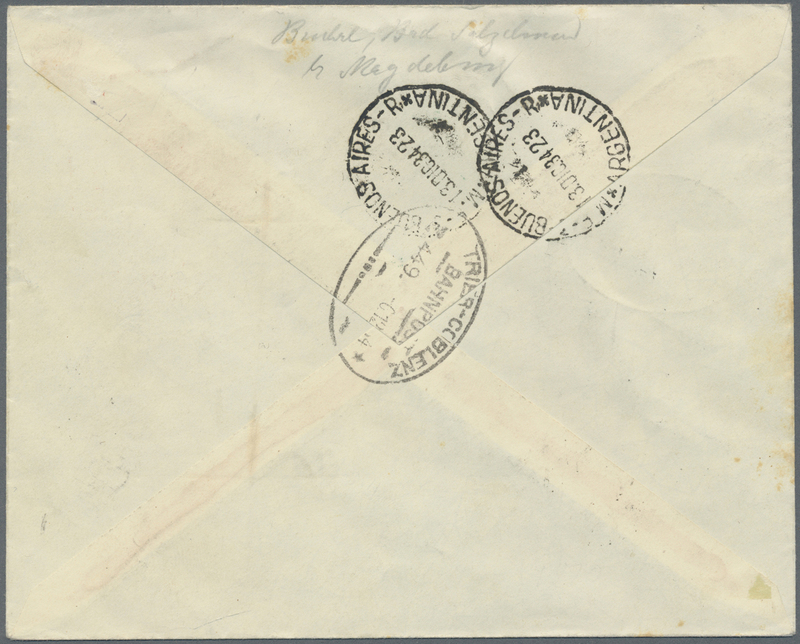 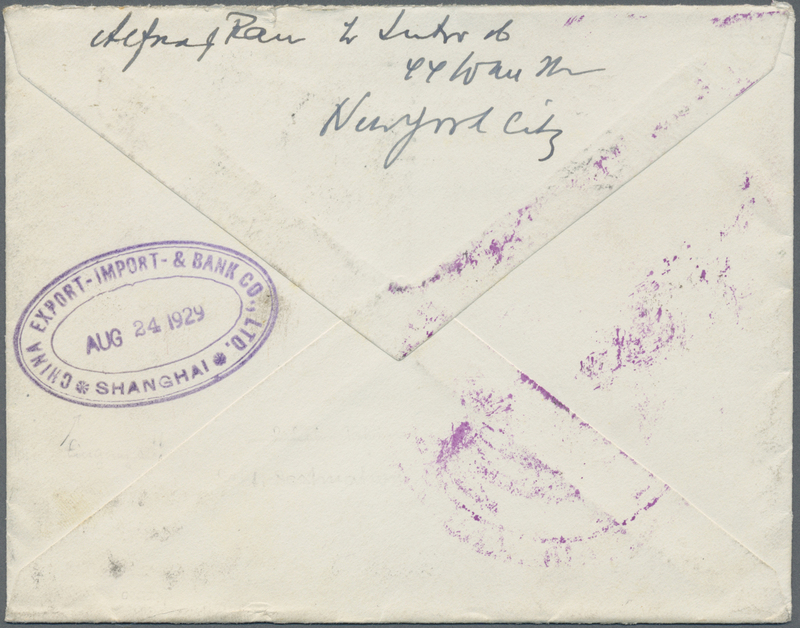 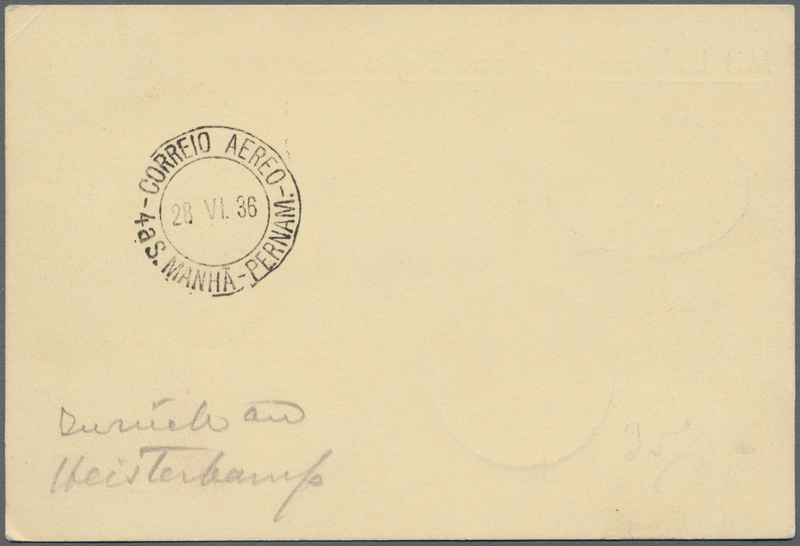 13757 Brief (cover) Si 28 D 1929. 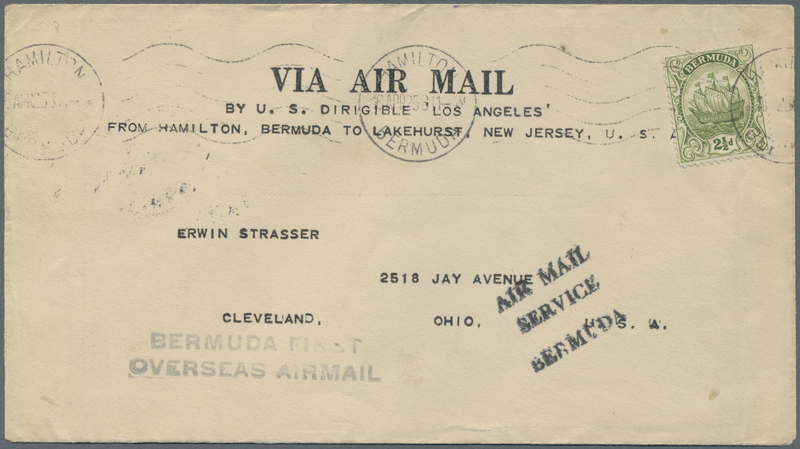 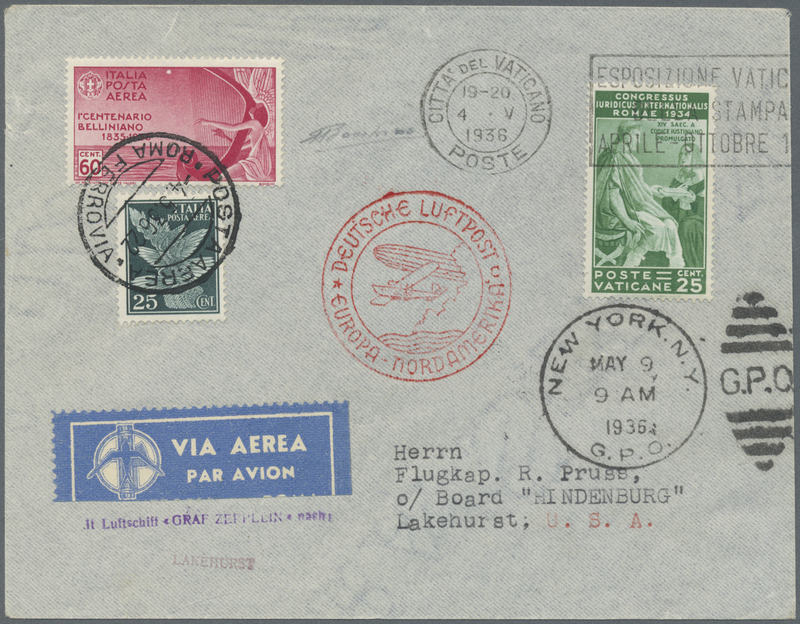 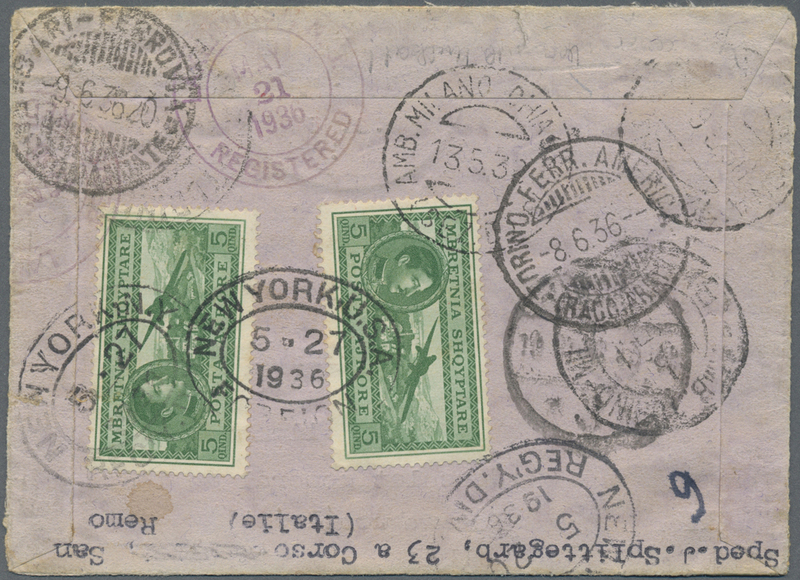 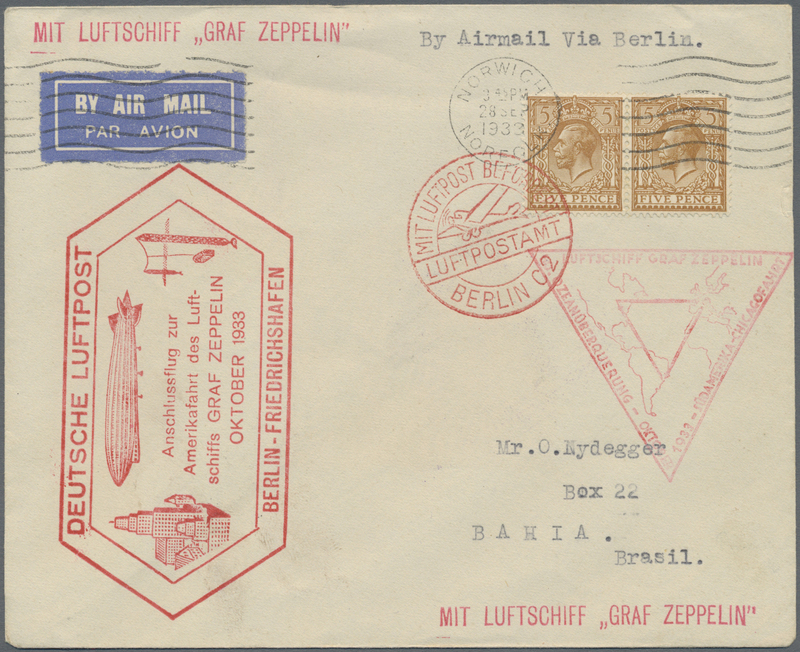 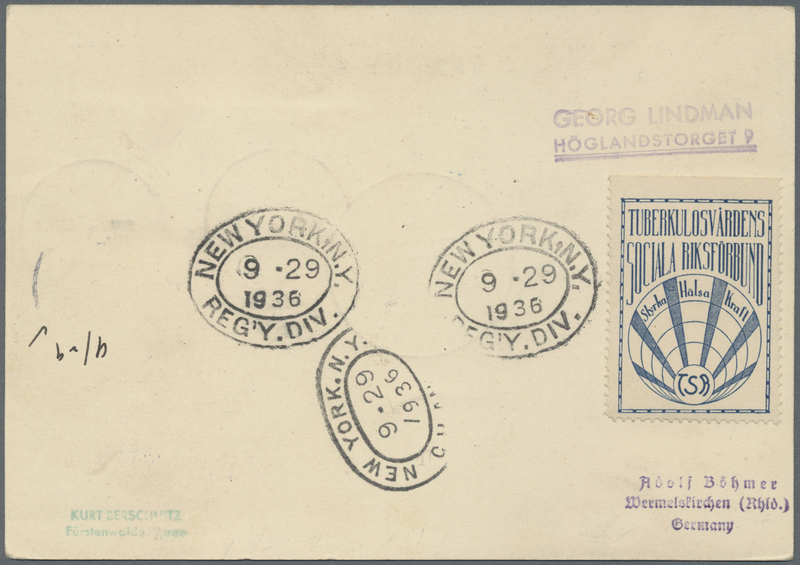 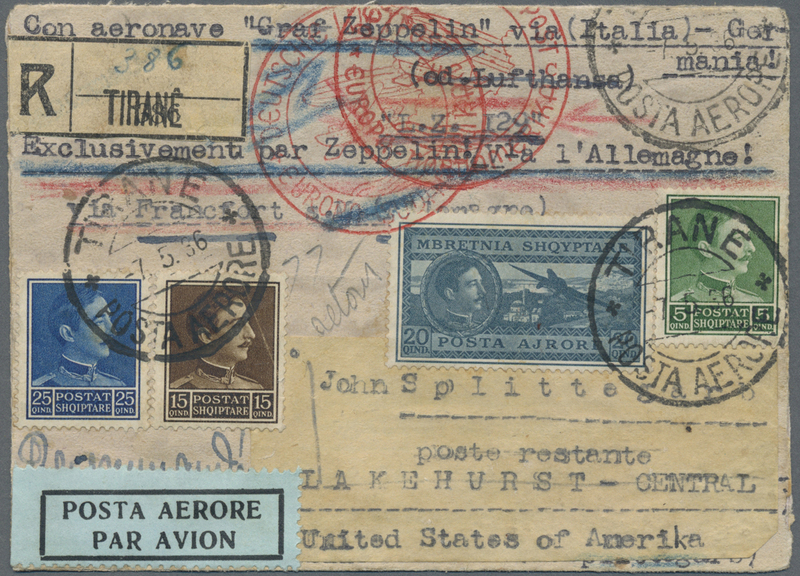 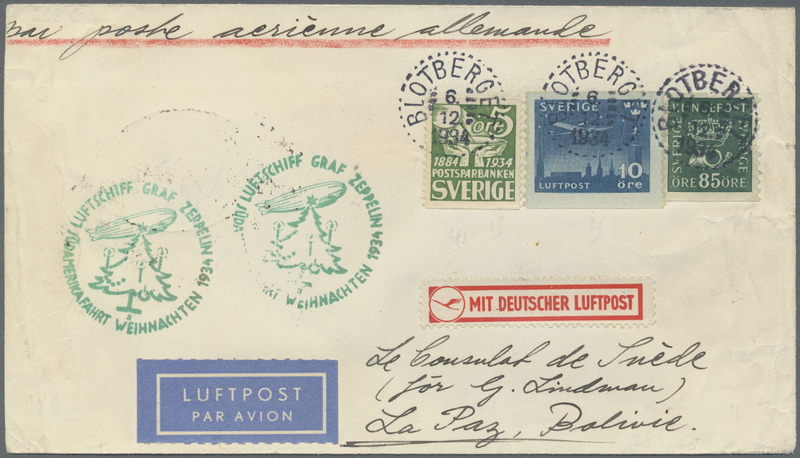 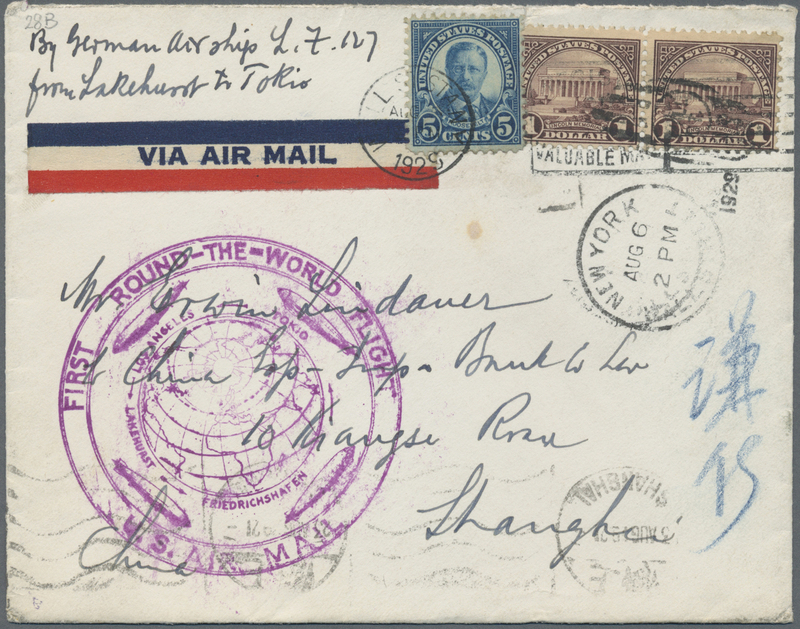 Cover flown on the Graf Zeppelin's USA-Germany Weltrundfahrt / Round-the-World flight Lakehurst with Lakehurst Zeppelin receiver reverse. 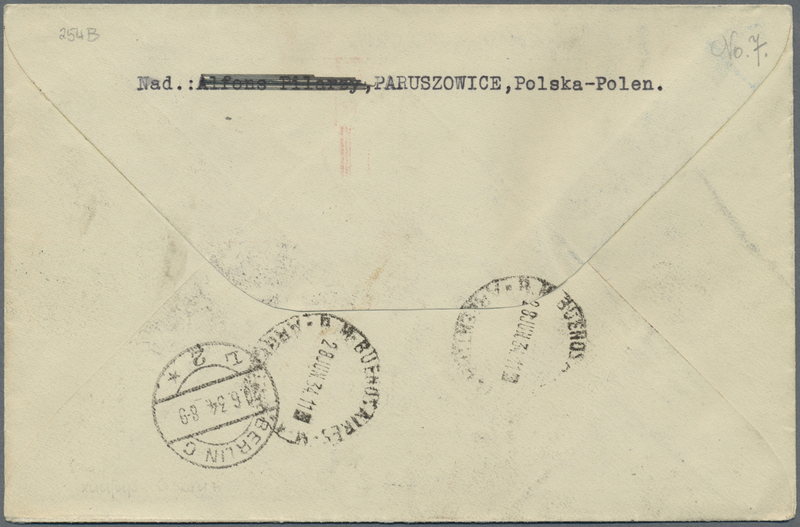 A bit worn. 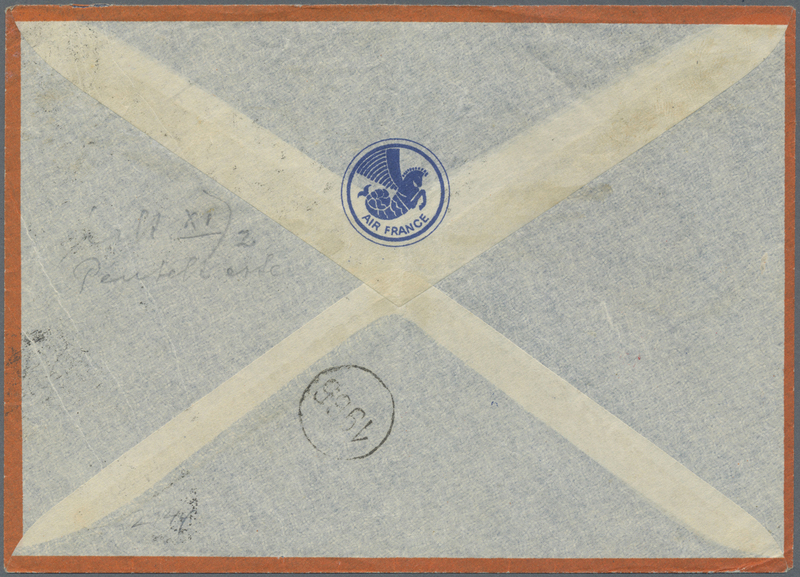 Very scarce high-value franking with $2 Franklin stamp (Scott 547) $1000 on cover.